To get to Bentong from Gombak, one have to go thru Genting Sempah. 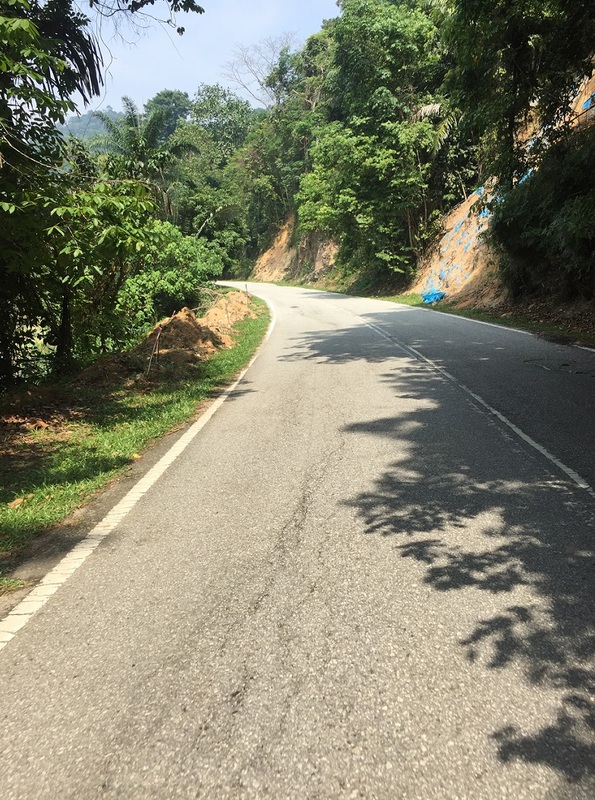 This was an old trunk road to Bentong before the 2 lanes Karak Highway was built. 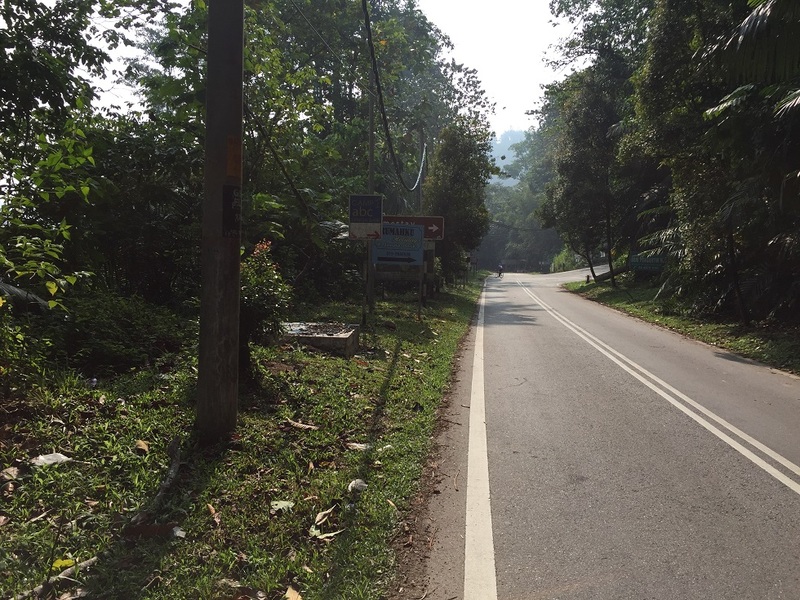 The highest elevation here is 654m but actual climb is only 535m from HOA (Hospital Orang Asli). It is spread out to 14.4km distance, so it wasn’t so bad at all. 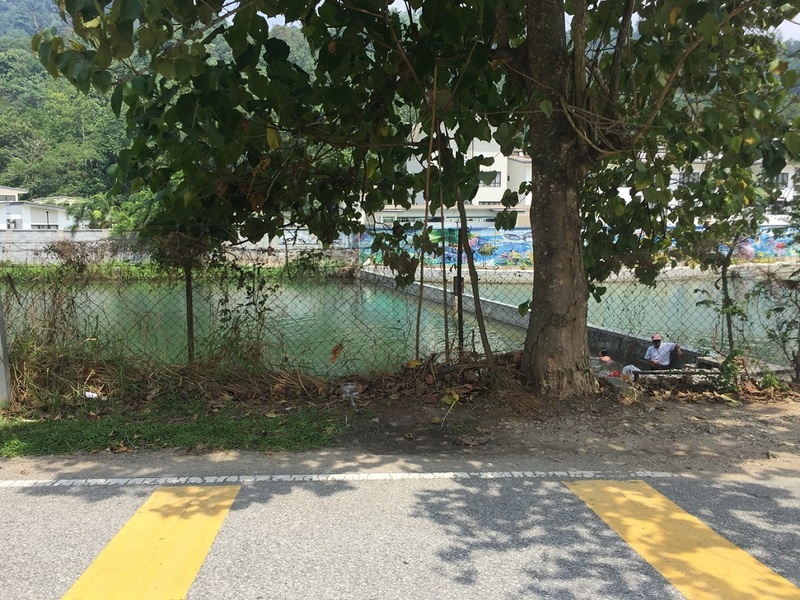 This is not entirely a new route for me and I have blogged about Gombak to Genting Sempah before. 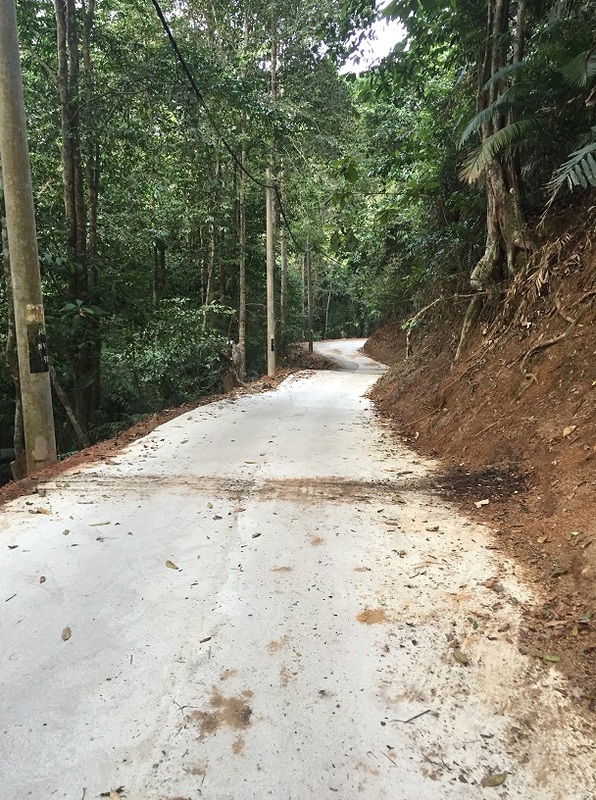 This is actually a very nice route as both side of the road is covered with rainforest trees. It is not hot and the road is nicely paved. 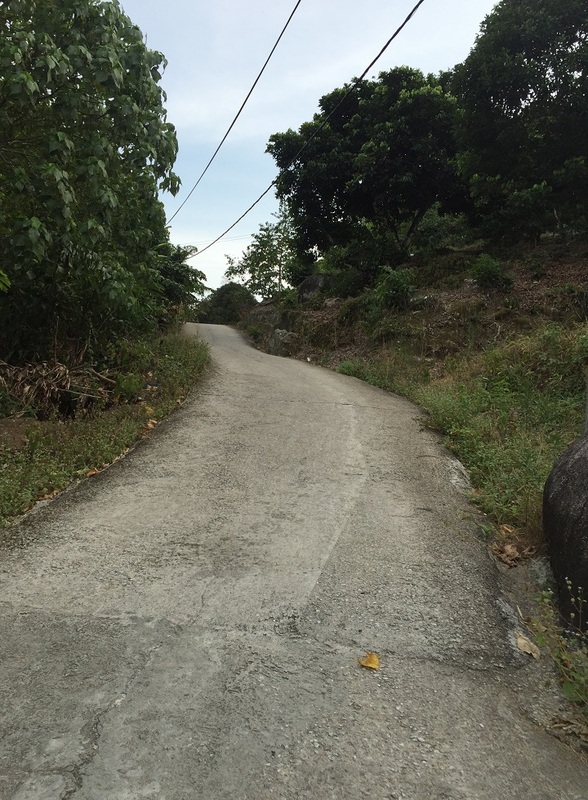 It is also not a hard climb as the average gradient is about 2-3 degree only. A perfect 1-2 hours ride on your busy weekend. There are 1-2 areas that you might want to get the momentum going to push up the sloop or off saddle pedaling. Other than that, it is an easy ride. 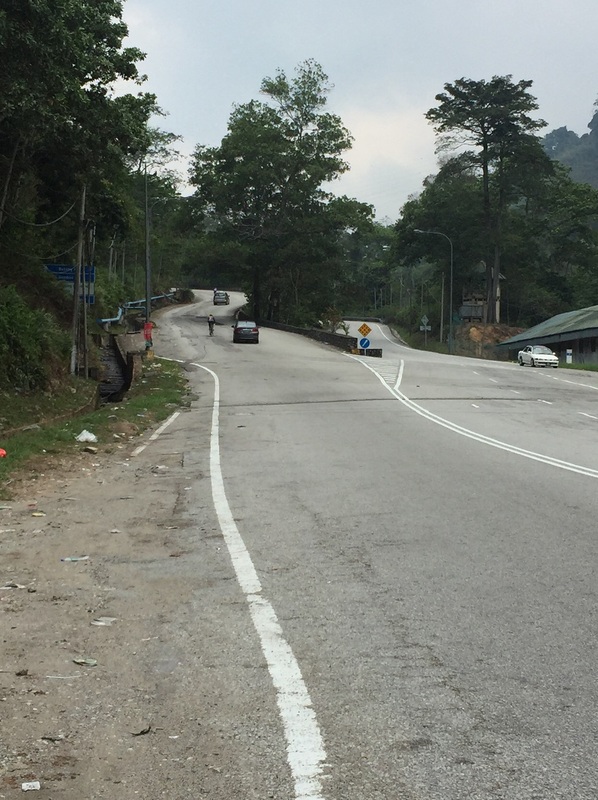 What’s new for this ride was Genting Sempah to Bentong. This was like interstate riding as we were riding from Selangor to Pahang state and back. 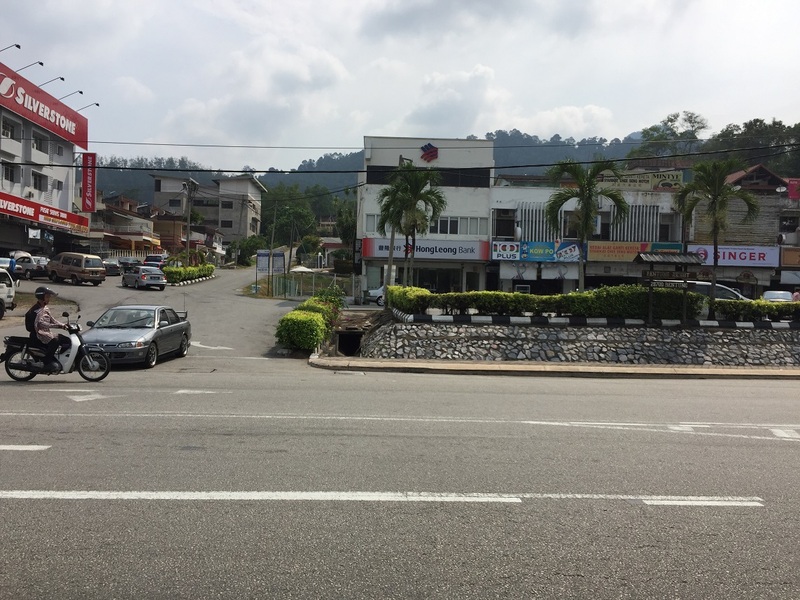 Bentong is located in Pahang and it is a border town. 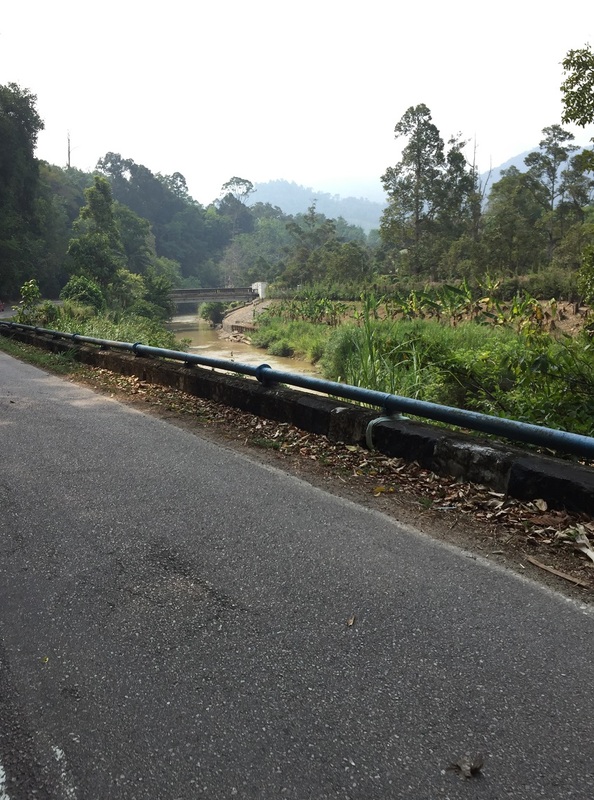 From Genting Sempah to Bentong town is another 33km but it is all downhill and flat road. 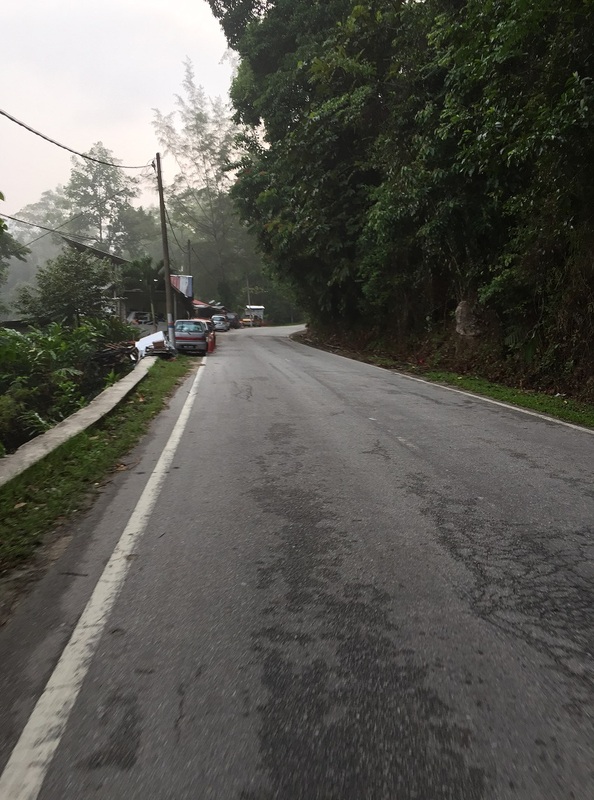 Going back Genting Sempah was not so bad as the average climb was only 1.5 degree gradient and climb for 20km. Though it was hot when we rode back but there were trees cover here and there. Therefore, it was not as bad as Titi ride. The only setback here was the road condition. There were holes and cracks here and there. 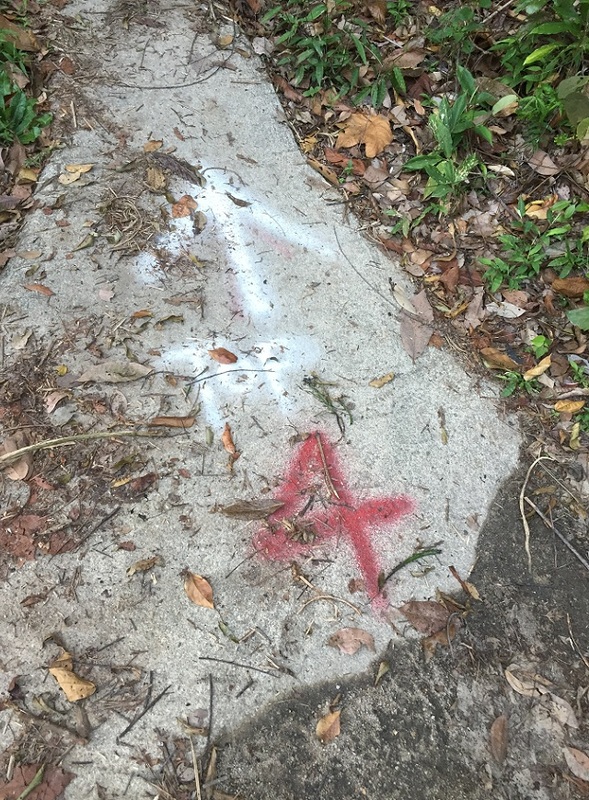 So, you will have to constantly watch out for the uneven grounds and holes. This can be tiring too as it has too much vibration. The last 500-800m was the hardest to climb. 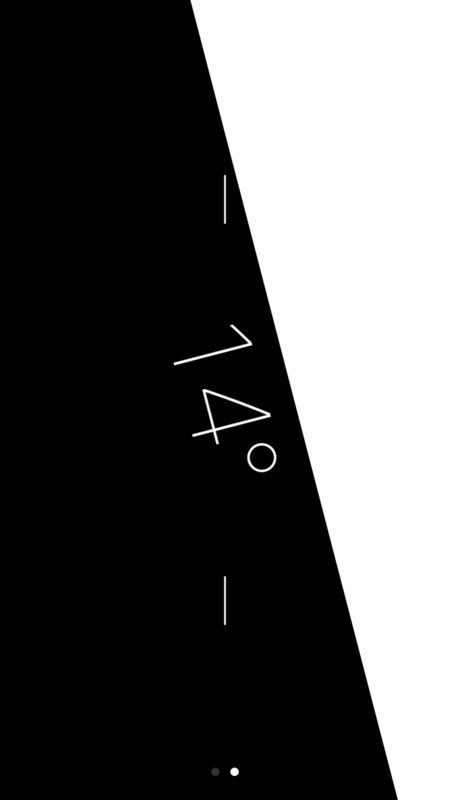 It has around 5-8 degree gradient. If your largest cog is at least 28T then you will be able to pull thru. Or, just stand and pedal. 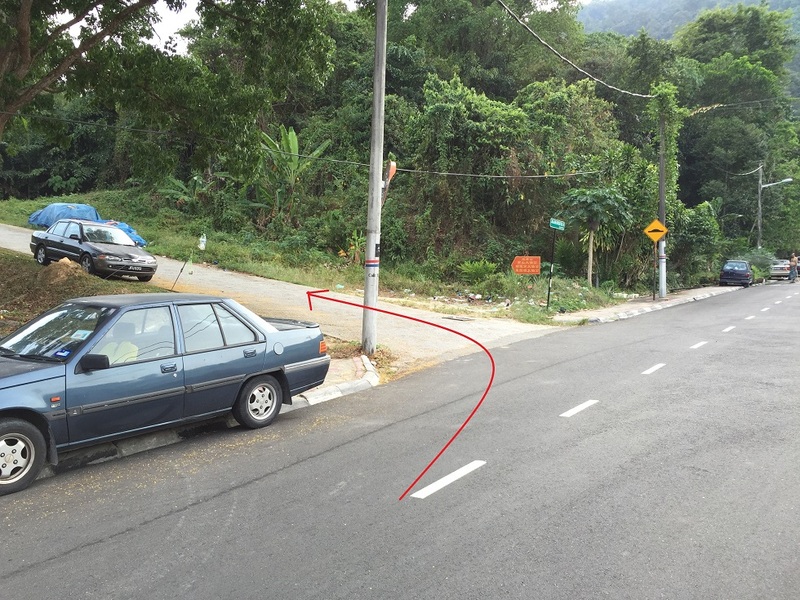 Turning right here is to Janda Baik route but there is no turning require going towards Bentong. 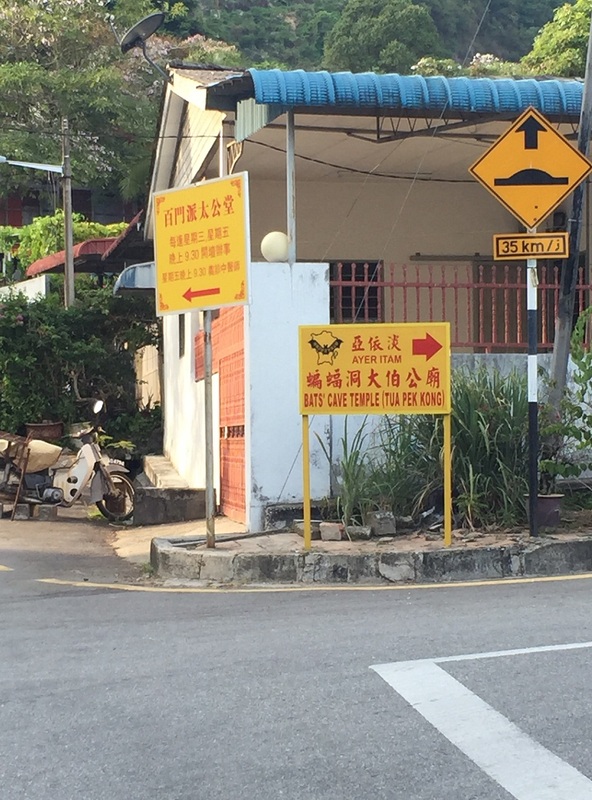 Well, at least not until you reach Bentong town. You will cruise downhill and along the river. It reminds me of driving in Colorado except that the water in Colorado is clean and clear. 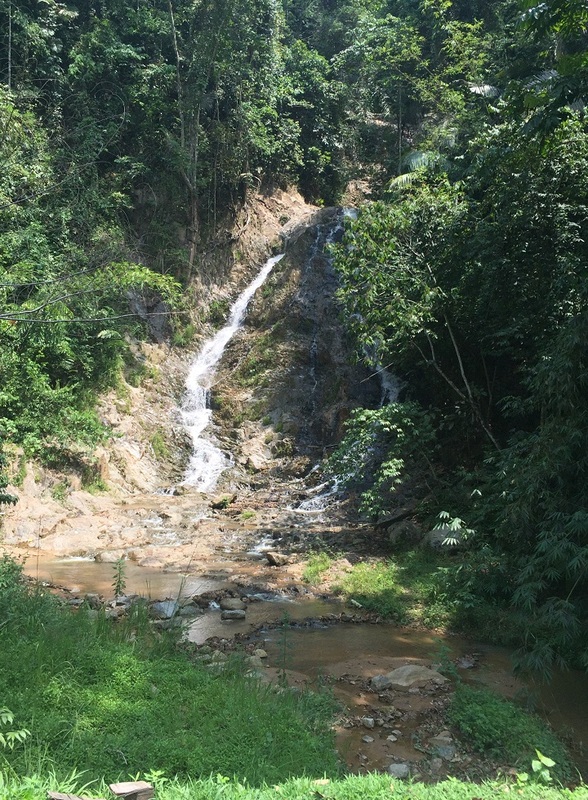 Also, you will be passing by a waterfall and a hot spring. The iconic sign of Bentong. I saw this post in every cyclists Facebook. Coming back may be hot but there are trees cover here and there. This is the start of the last tortures climb. It may seem easy from here but there are 1-2 stretches that may require hard pedaling. While you are at Bentong town, don’t forget to get a refreshing Ice Kacang from Kow Po café just next to Hong Leong Bank. 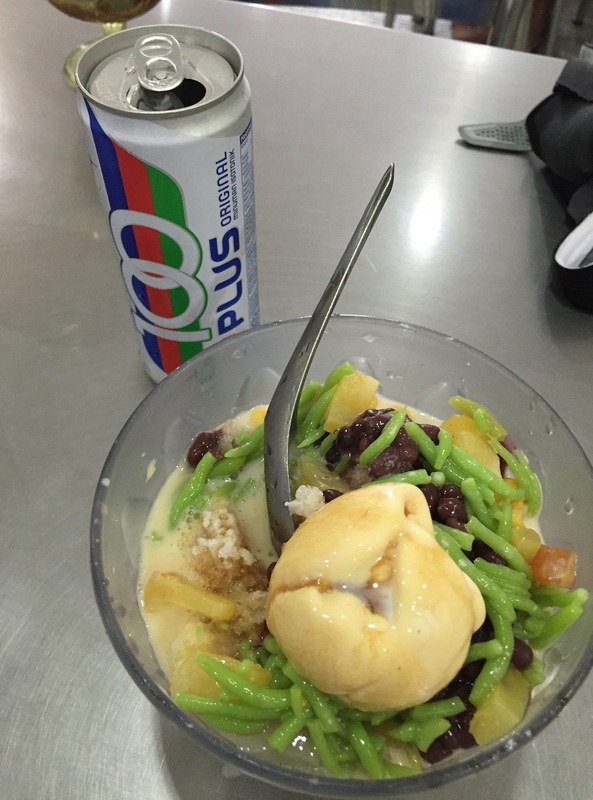 A can of 100 Plus and a small bowl of Ice Kacang with ice cream cost me $6. 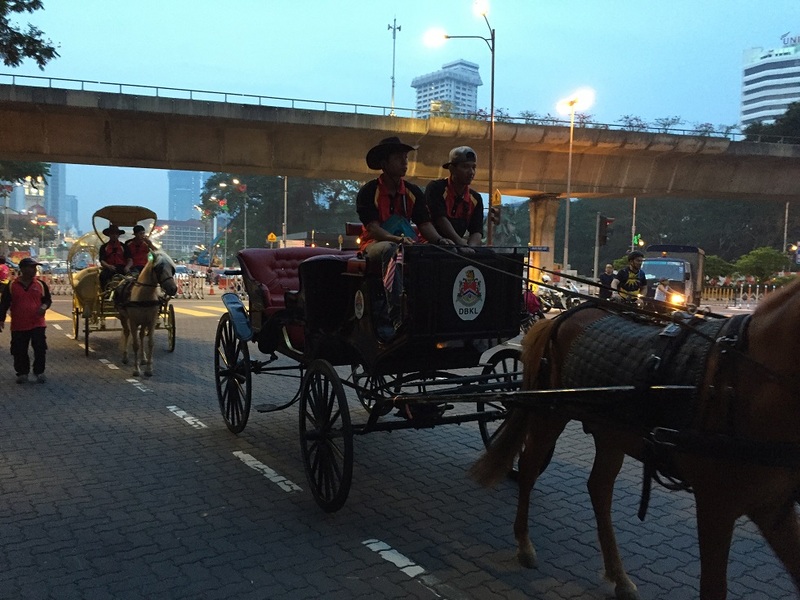 This is mainly for recreational or fun ride, so it is very suitable for family outings. 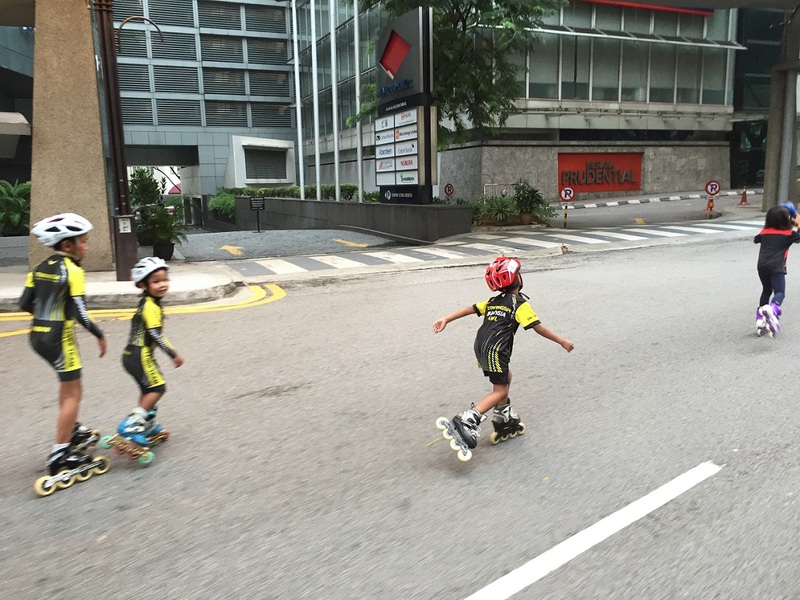 Part of the KL city center is closed for 2 hours (7-9am) from traffic for people to enjoy the outdoor outing. They used to hold it once a month and always on the 1st Sunday of the month. Now, it is twice a month and on the 1st and 3rd Sunday. 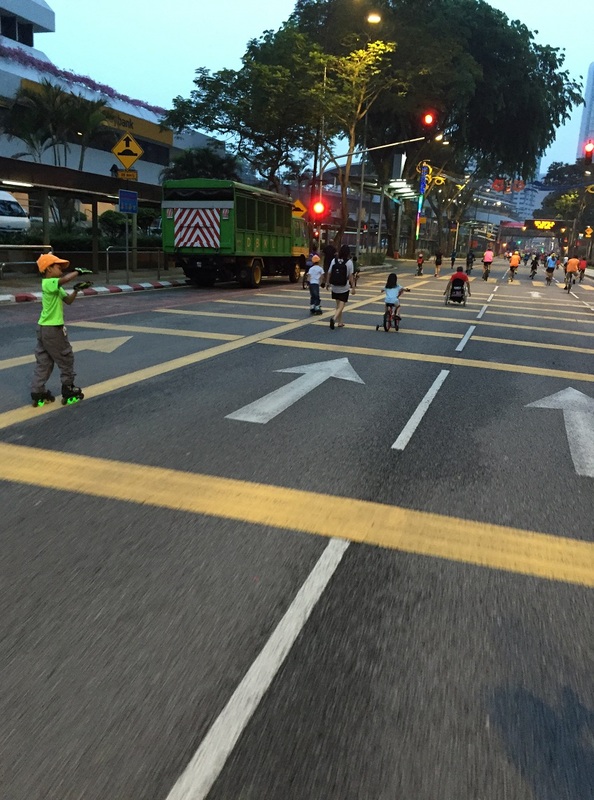 You can get additional info here: http://www.klcarfreemorning.com/index.asp. The loop covers about 7km long so you can do about 2-3 loops of leisure ride. Don’t want to ride? Well, you can join a bunch of joggers or you can walk also. Basically it is opened to all people except for motorized vehicle. But I saw a bunch of noisy motorized scooters. I guessed it is allowed. As said, this is fun ride for families. Therefore, you can’t ride your bike fast here as there are people jogging in the middle of the lane, slow cyclists or some will just stop in the middle of the road without giving any warnings. You will need to be alerted at all times or ride at the most outer lane. 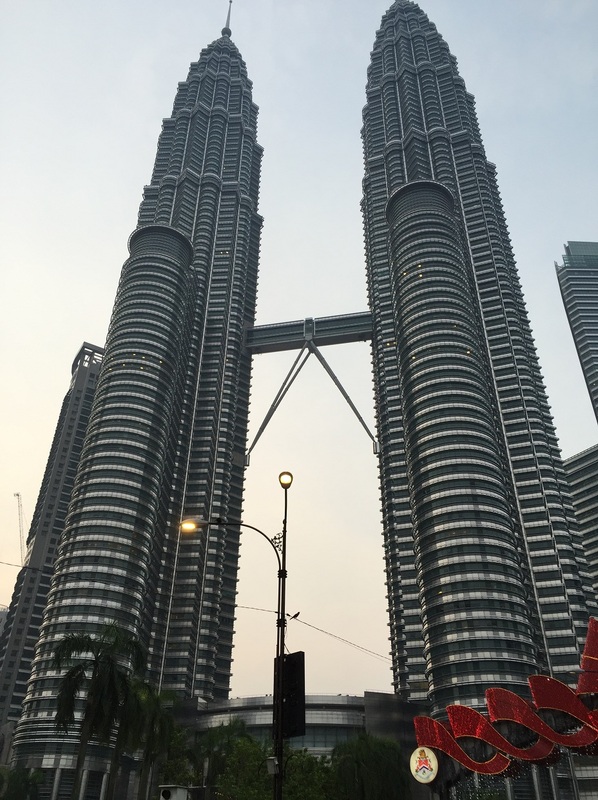 The route covers the iconic Petronas Twin Tower (KLCC) and Menara KL (KL Tower). Lots of people (including me) stopped for photos. So, do watch out for those people. If you do stop, please stop at the side of the road. 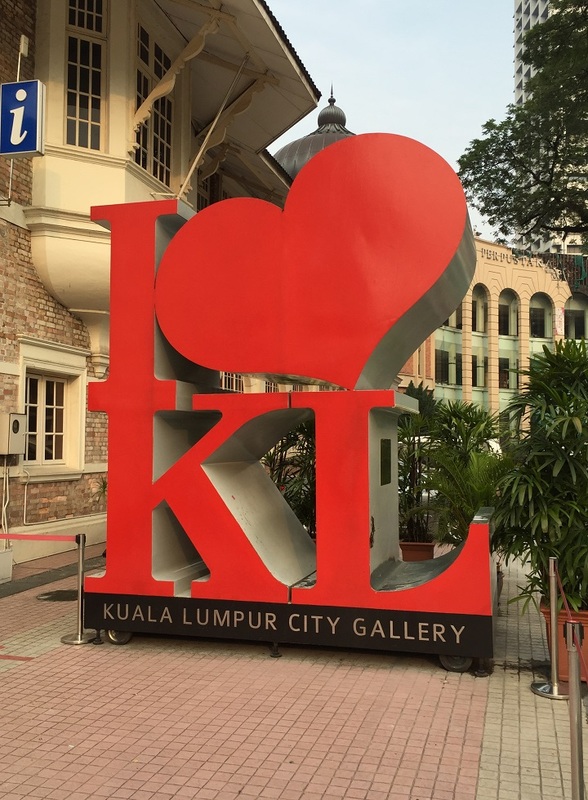 Do remember to stop for pictures at the Merdeka Square. Hungry? 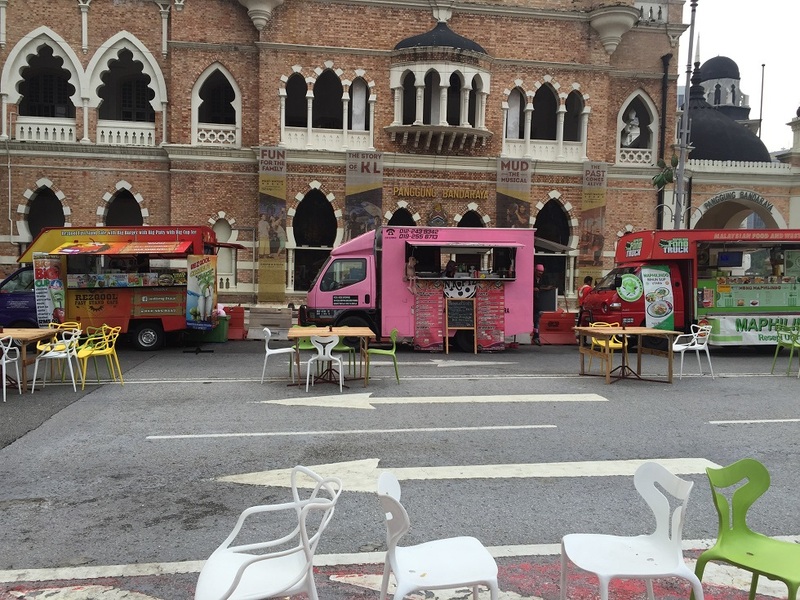 Food trucks are ready to serve you. If you are staying around the area and don’t feel like driving out, then this is a place to bring your children to ride. I would consider quite safe if your speed is slow. Or, if you are a tourist and wanted to join the crowd, the OCBC bank has donated some bikes that you can borrow it for free. Just don’t expect they are giving you Trek, Speicalized or Cannondale bikes. They are rideable but some are in bad condition. So, be there early to choose your bike and have fun. 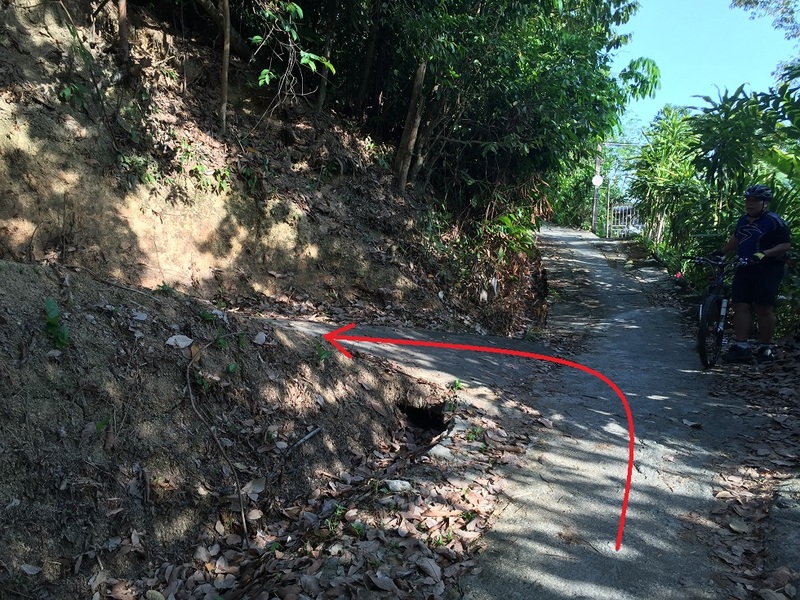 This is another killer hill in Penang but don’t be despair. 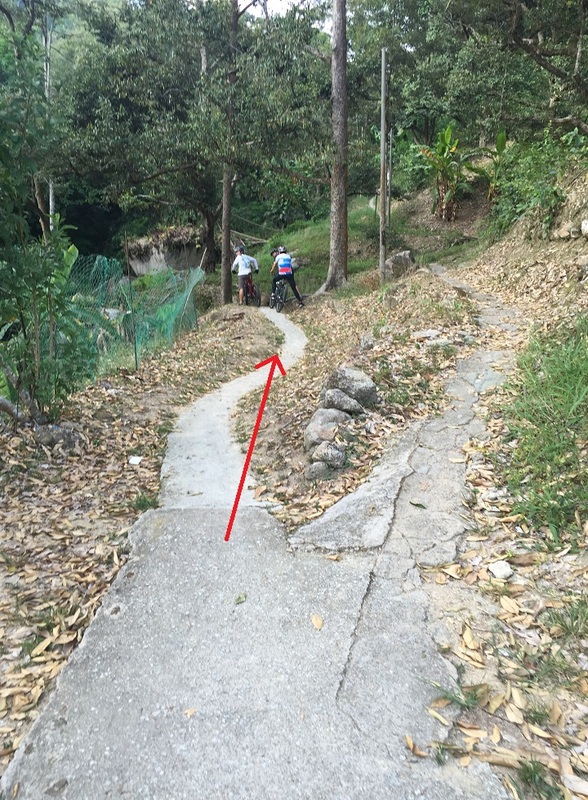 The trail is wide enough for you to do a zig zag and it is cemented track. Yes… it is cemented. 😦 Nanshan (南山) or literally translate to English is South Hill and Penangnites called it Namsua (in Hokkien). 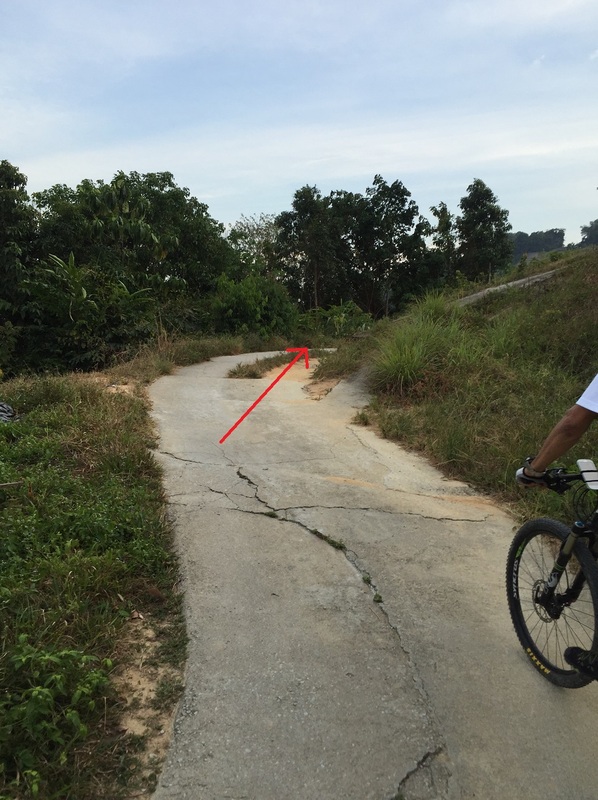 This hill is located in Paya Terubong which is in between Sg Ara and Air Itam Dam (AID). In fact, it is connected to Hilton stop but today I will not blog about it as I have yet to explore there. 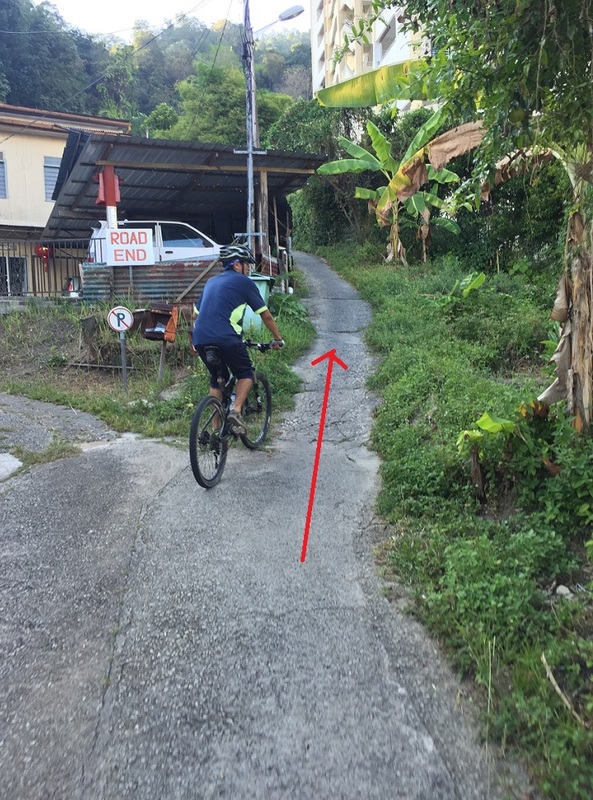 This trail is a very good training ground for those who are staying around or want to do a quick 30-45 mins intense hill climbing training. It was like me trained at Pearl Hill. 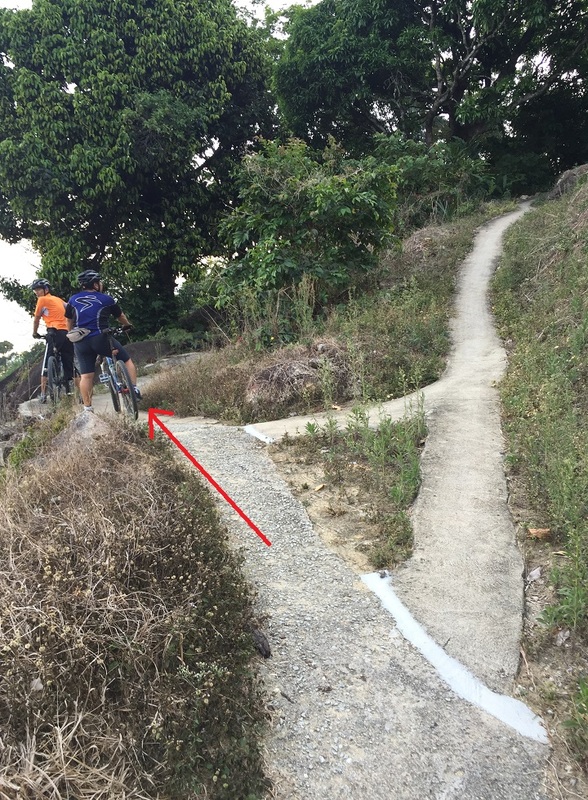 It is definitely not for enthusiastic mountain bikers as it has zero technicality and the trail is nicely paved. Not to mention it is wide too. The only difficulty is endless climb. Average gradient is ~8 degree climb but some part is around 14-25 degree. It is a category 3 climb in Strava. So, it is not as bad as in Hye Keat or TSLK. 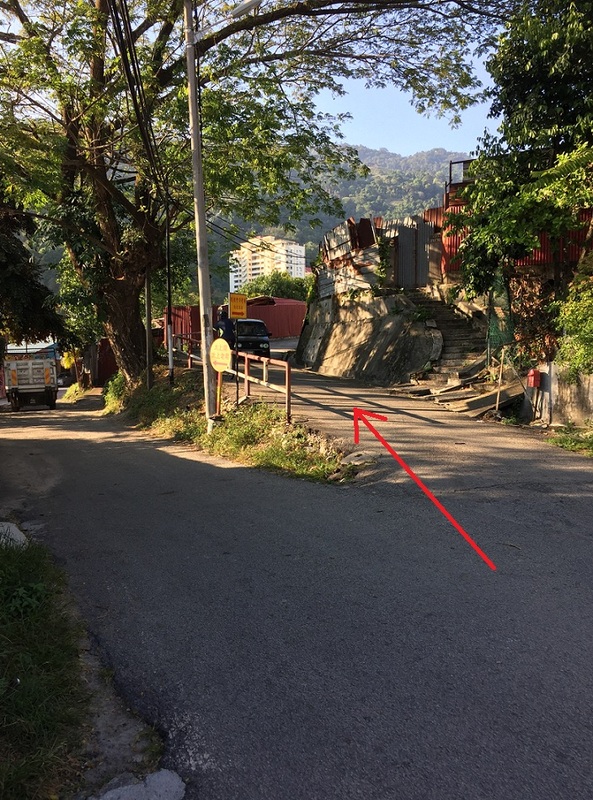 To get there:- Turn into Jalan Oriental 6 from the main road – Jalan Paya Terubong. 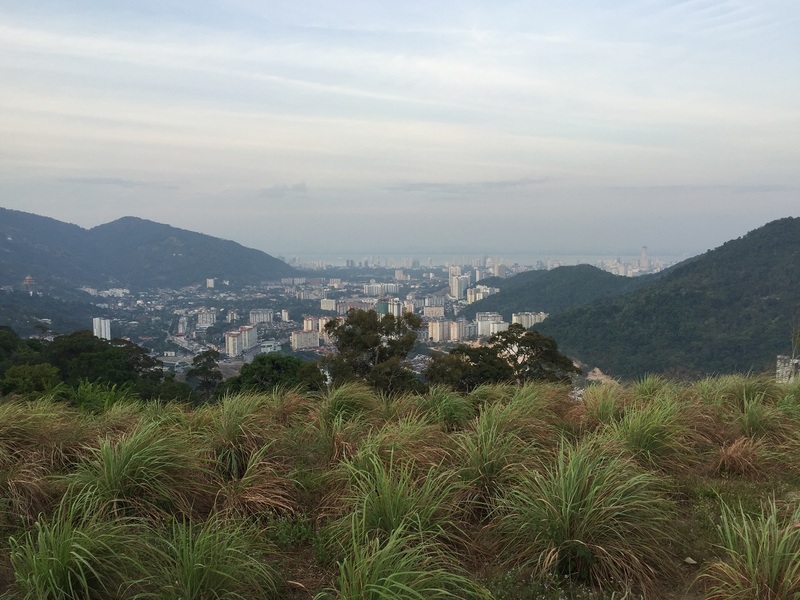 There are always bond to have a good view when you ride in Penang. Whether you are riding along the coast or up on a hill. 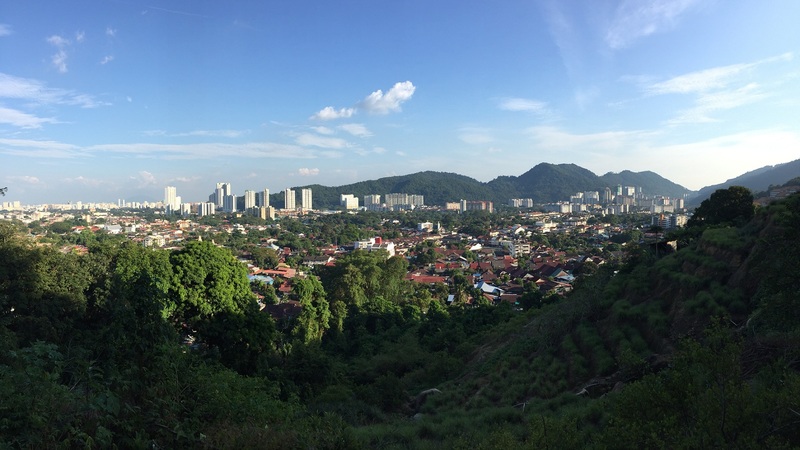 At the middle of the hill you will see the Paya Terubong suburb. 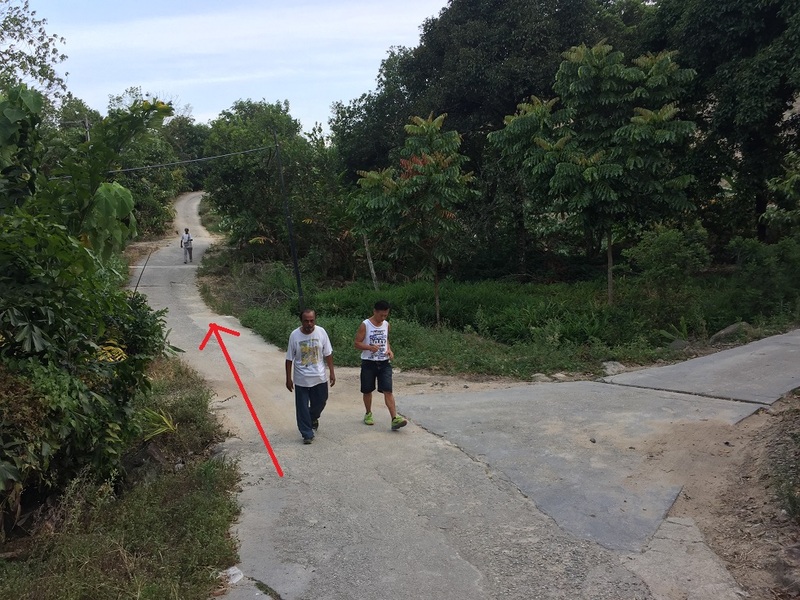 Normally, people will stop once they reached a Chinese temple but that is not at the top of the hill yet. 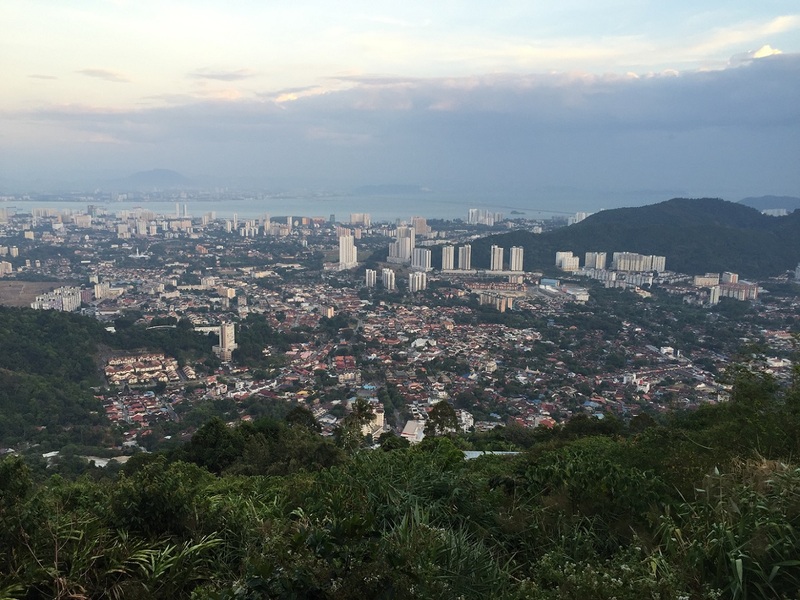 If you opt to continue after the Chinese temple, you will see a wider view of Penang. 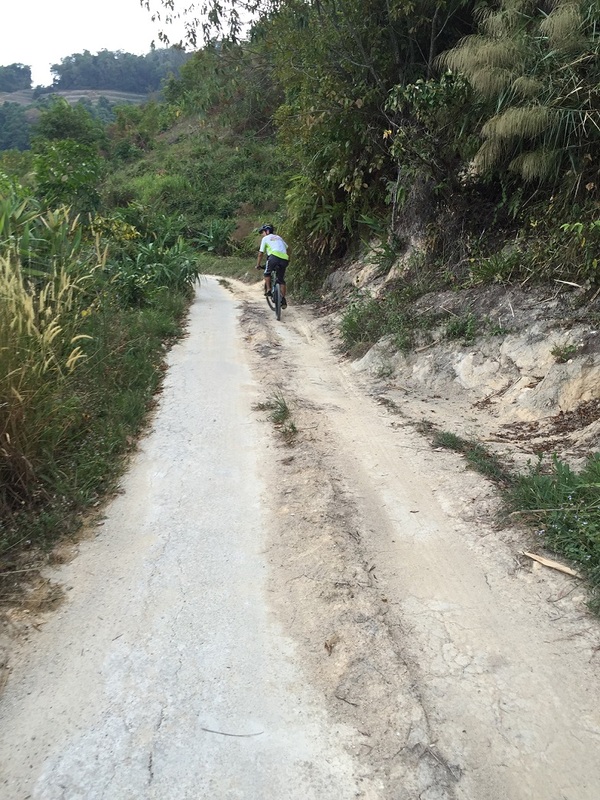 After the temple, it is easy riding with gradual climb and part pf the trail is cemented and non paved road. 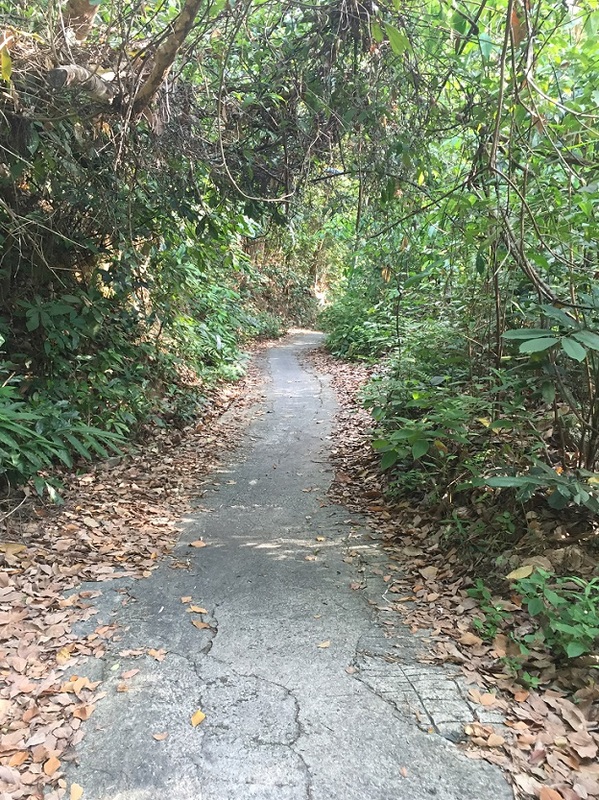 If you wish to continue, the trail will lead you to a fruit farm. Highest elevation at this place is 432m. As I mentioned earlier there are 3 ways to get to Fox Hill but Bat Cave trail is not a complete trail. Why? 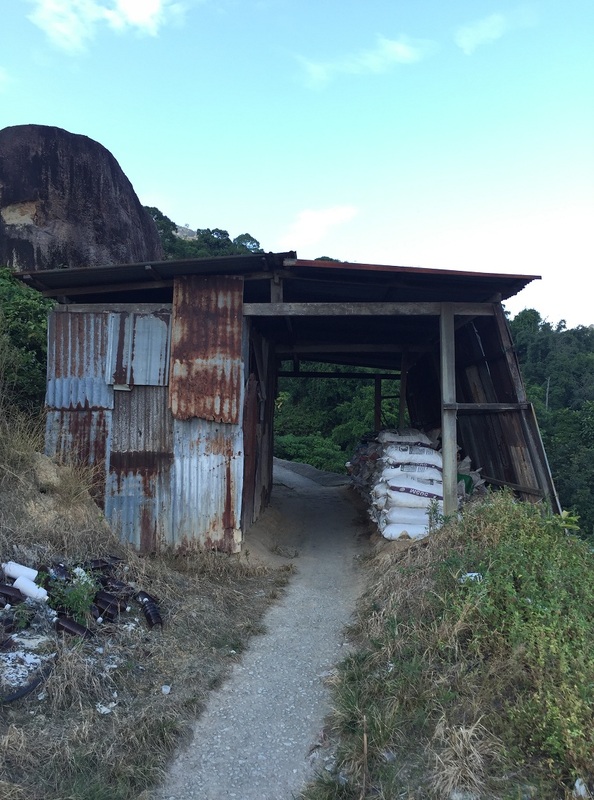 The Bat Cave trail will eventually link up to Hye Keat before hitting Fox Hill. 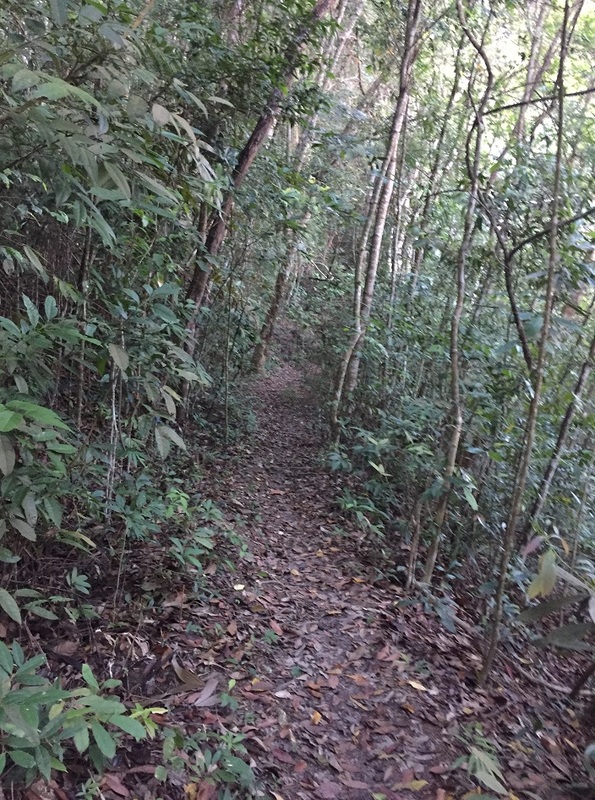 Most of the trails in Penang are interlinks. So, you can hardly get missing if you follow the downhill cemented path. Most probably you will be chased by dogs. Which is the hardest to climb among the 3? I would say Thai Siang Low Koon (TSLK) is still the hardest as it has nonstop climb. But, there is no easiest trail to get to Fox Hill. 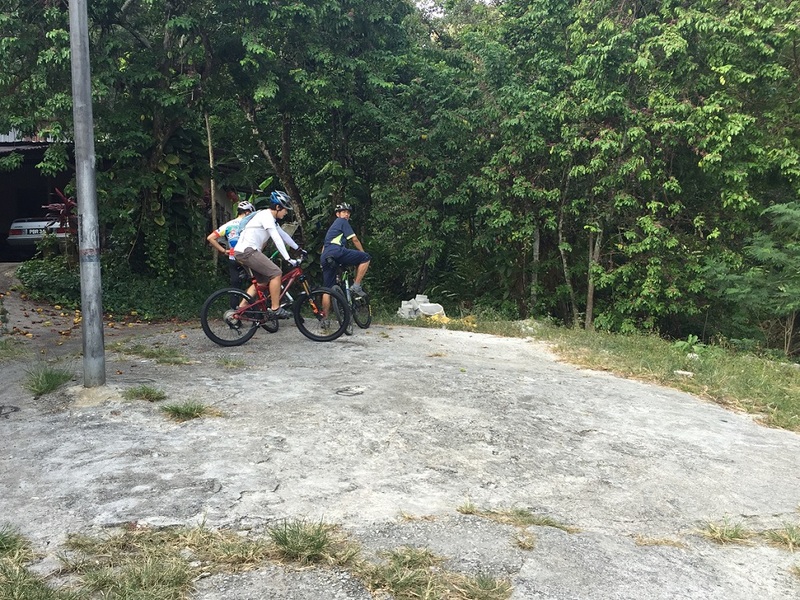 Hye Keat and Bat Cave trail are very subjective to each individual liking. The 1st 2km of Hye Keat is difficult to climb whereas Bat Cave is easier to climb at starts but it gets harder after 1km. The elevation for the 1st km climb is 89m only but from 1km to 2.4km, it climbs 310m altitude or an average of 12.5 degree climb. 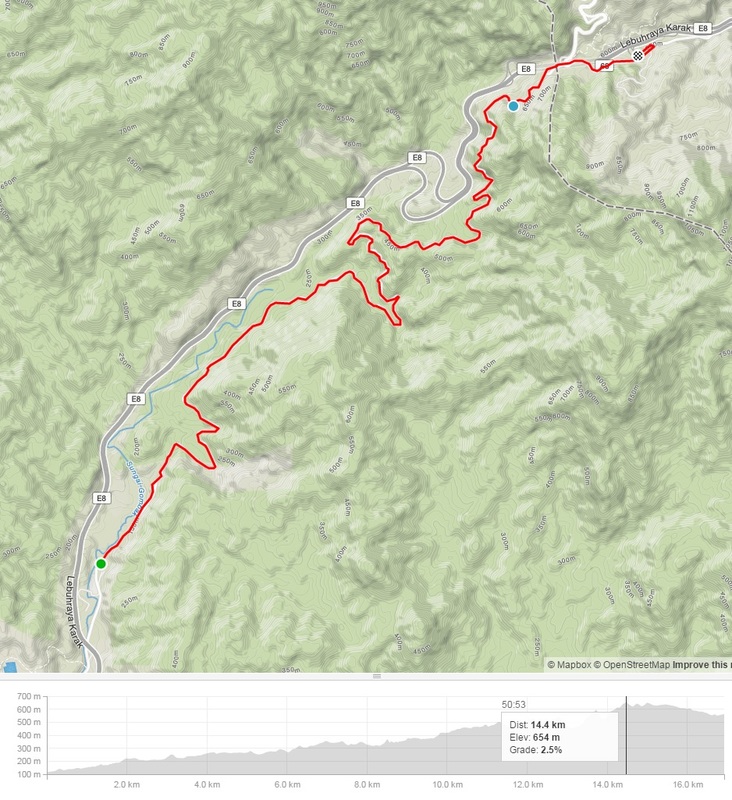 Personally I like Bat Cave trail as I drive there and I don’t like to do hard climb when my body is not warm up yet. So, the 1st km ride work out fine for me because by the time I hit the area where the climb is harder and my body is all warm up. The average gradient is about 10 degree for the whole trail but there are few areas about 12-15 degree. 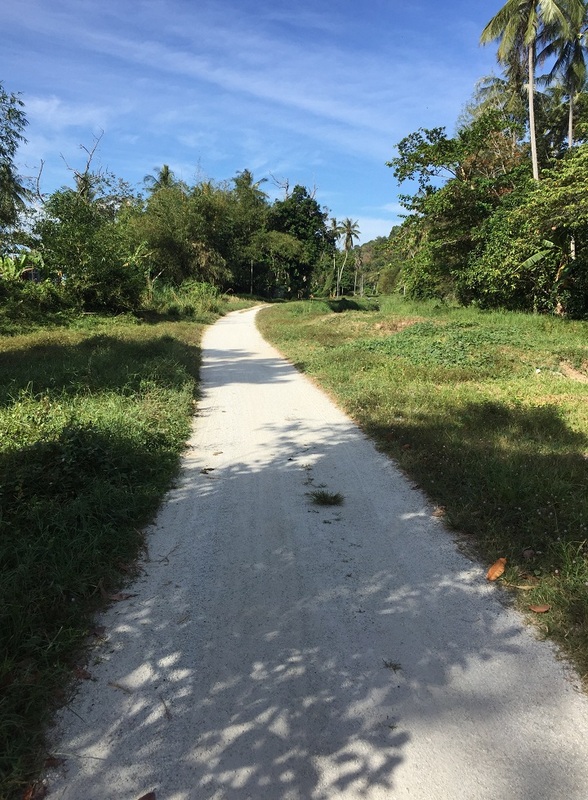 Once it connects back to Hye Keat trail, it is pretty easy ride from there onward. 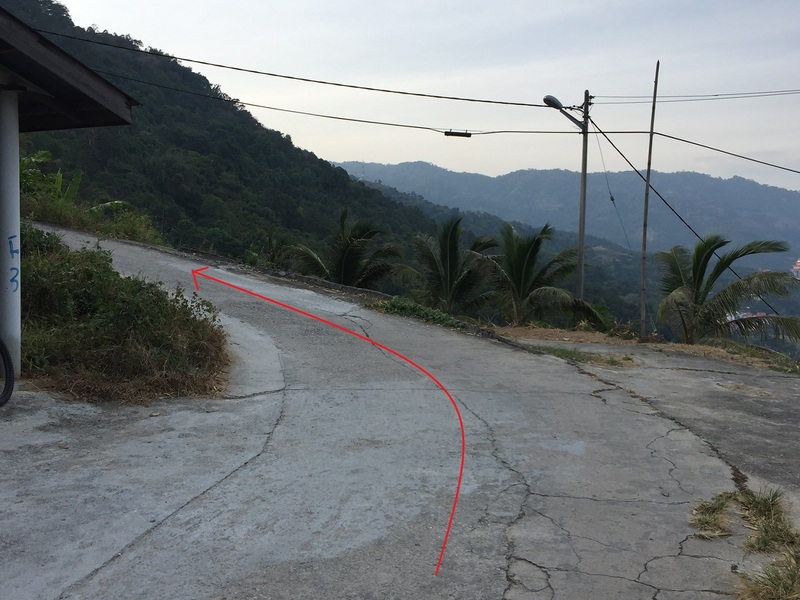 This seems like the end of the road but it has a single cemented track connected to this road. Just get onto the cemented track. Then follow all these red arrow path that I have marked here. Some of the harder climbs. Ride after ride and all the hard climbs I have made. There are always cool breeze and magnificent views waiting for me. Just stop and enjoy it. I am sure you will love it too. 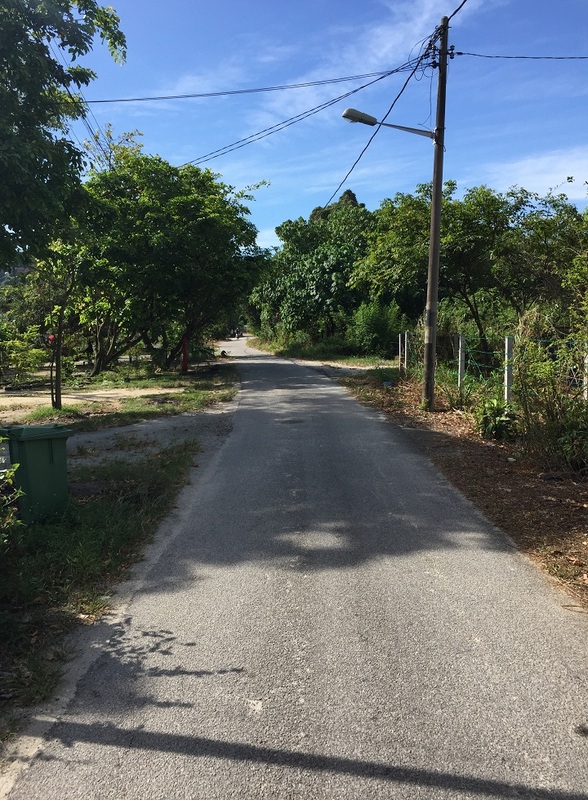 Eventually, you will connect back to Hye Keat trail as I have shown this earlier. 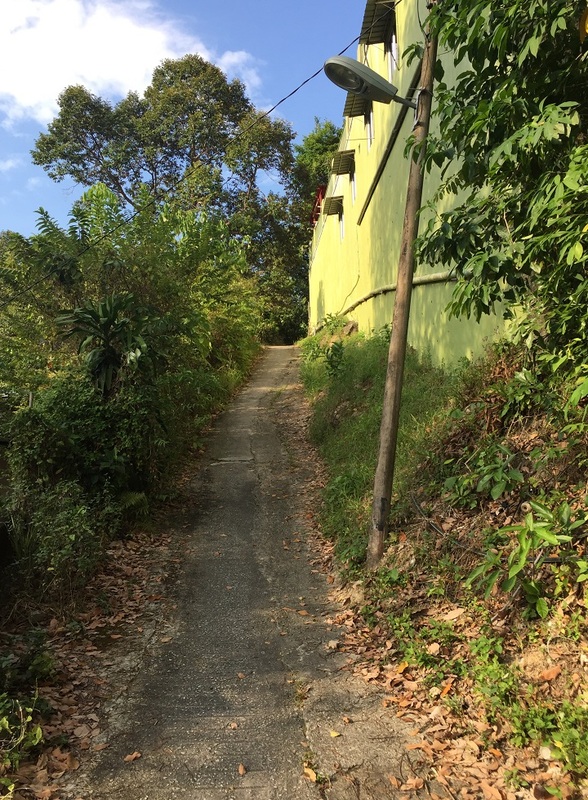 Do read my Hye Keat and TSLK trail to continue to Fox Hill and back to AID. 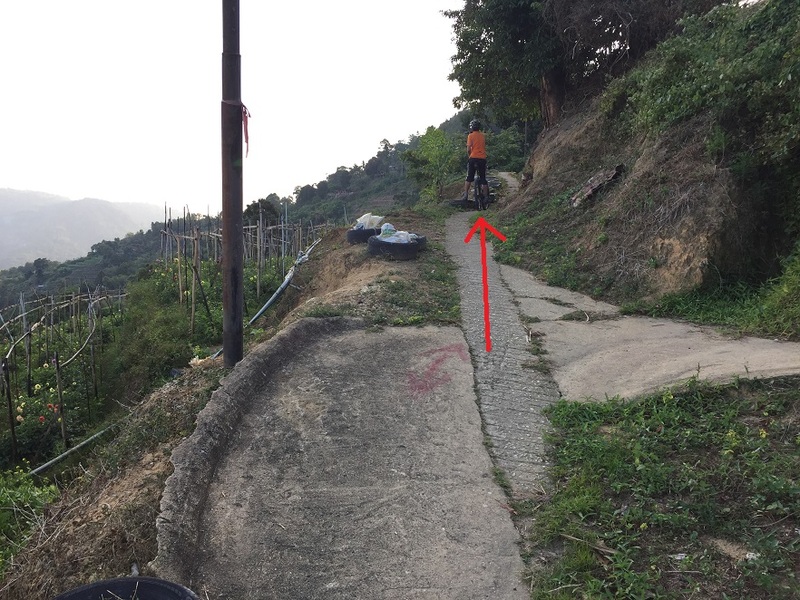 Ok, I am done blogging my Taiwan trip and let me get back to my bike stuff now. 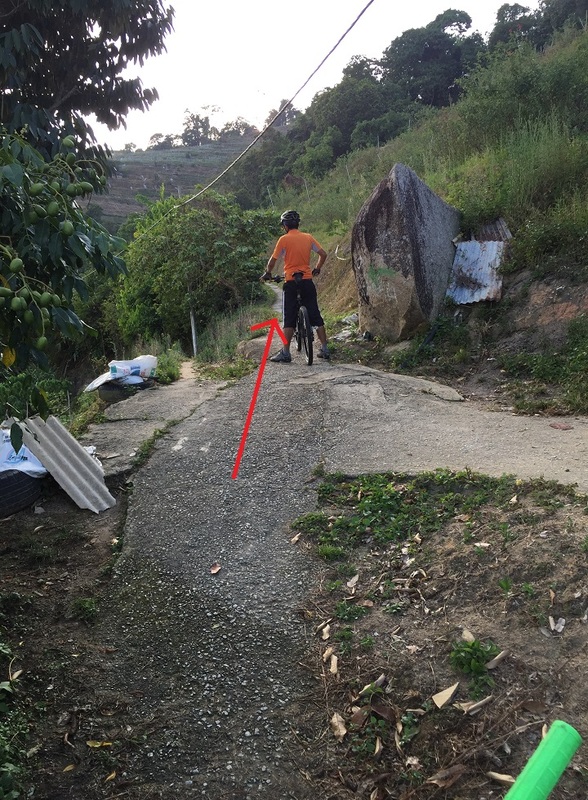 Back to the famous off road trail in Air Itam Dam (AID) – Fox Hill or some people called it Fox Mountain. There is no clear definition of how high a hill is before it can be called mountain. The UN has their own version of definition too. Years back in US, their definition is anything <1000 feet or ~305m is consider a hill and a mountain after that. But today, United States Geological Survey (USGS) is no longer put any definition to it. The highest point of Fox Hill is 418m. I guessed you can call it a mountain based on the old US definition. 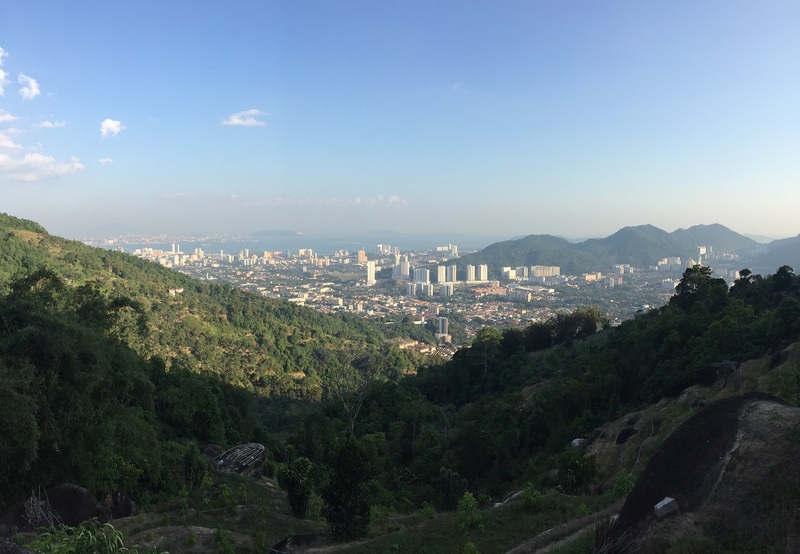 For me, I still call it a hill since Penang Hill elevation >700m and it is still called a hill. There are 3 ways going up Fox Hill. 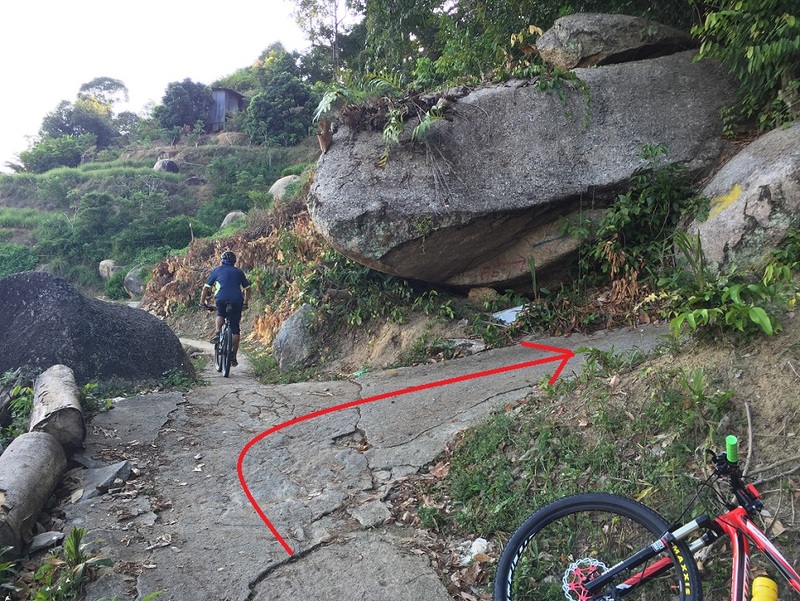 It can go up thru Thai Siang Low Koon (TSLK), Hye Keat or Bat Cave Temple. 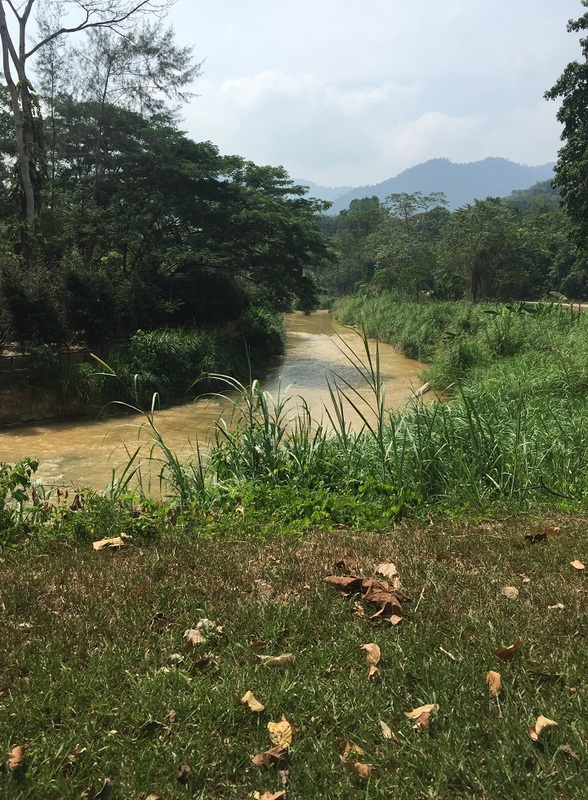 I have blogged about the TSLK to Fox Hill trail before, so I am going to write about Hye Keat now. 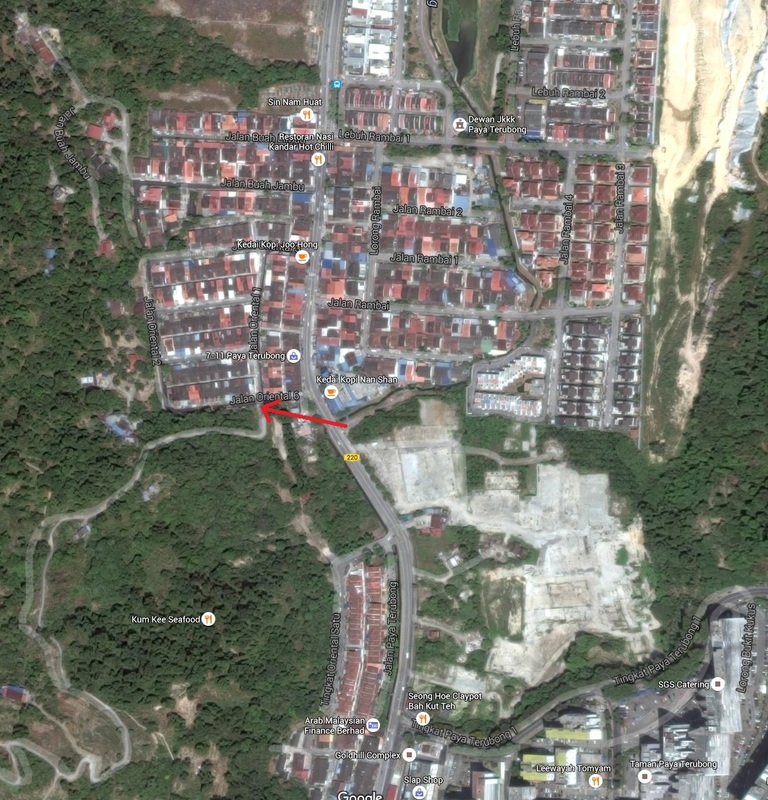 The trail starts at Hye Keat Estate near Air Itam roundabout as shown in the map below. 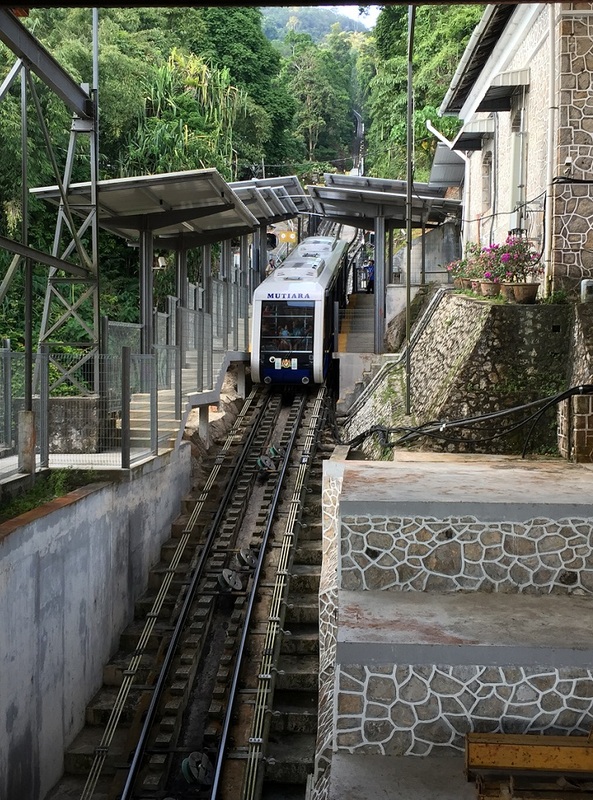 It will then connects to Penang Hill Middle Station and lastly Fox Hill. 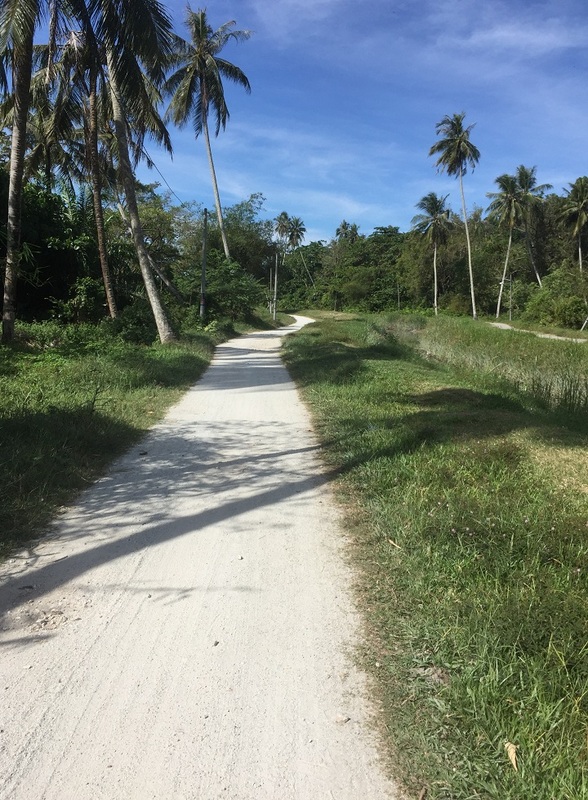 The trail is about 6km long only before it connects back to the main tar road at AID. The picture above shown 2 hills was because I went to AID right after I came down from Fox Hill. 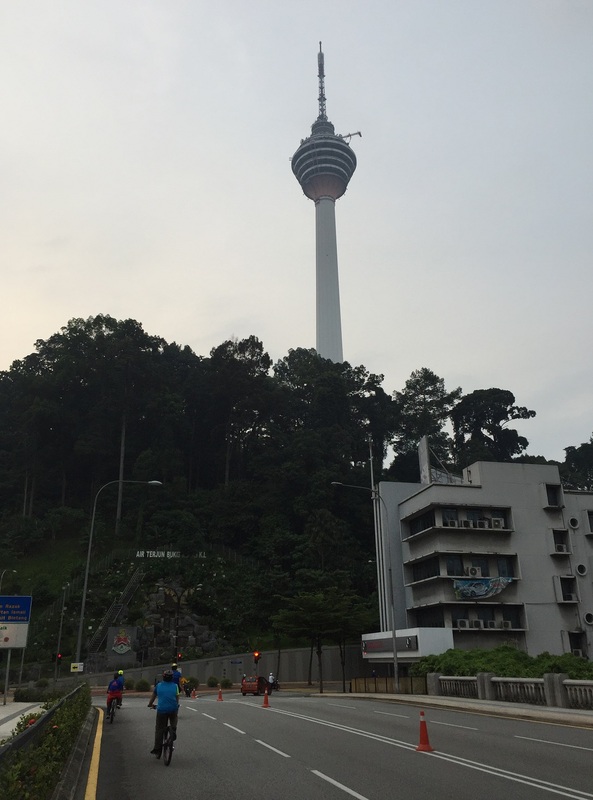 The highest point is 449m right after the Penang Hill Middle Station (train station). 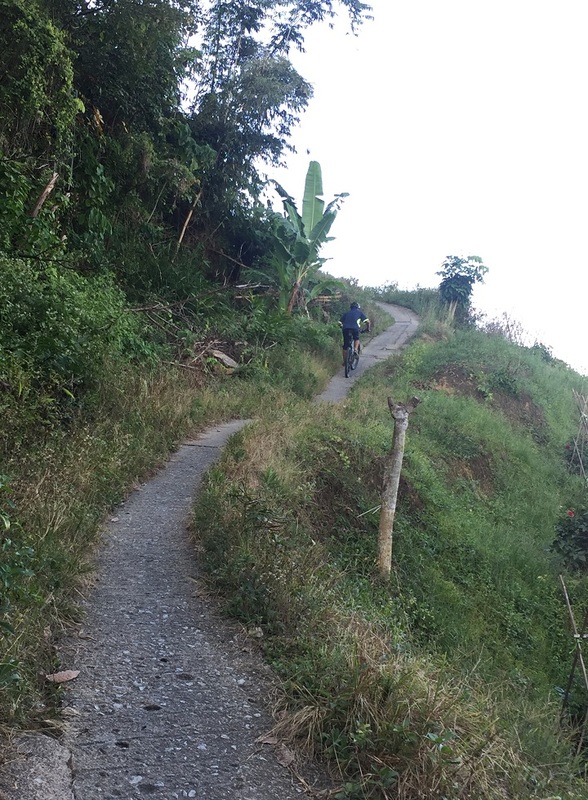 I would say this route is easier than TSLK as the steepness is still bearable. But, if this is to compare with Sg. Ara trails then this is like 10x harder. The average gradient is about 8.8 degree but don’t let that fool you. 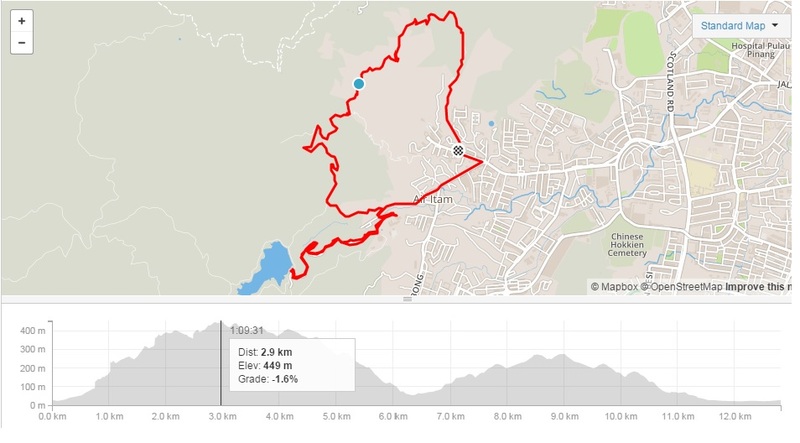 The first 2km climb is difficult and it is categorized as Cat 2 in Strava. 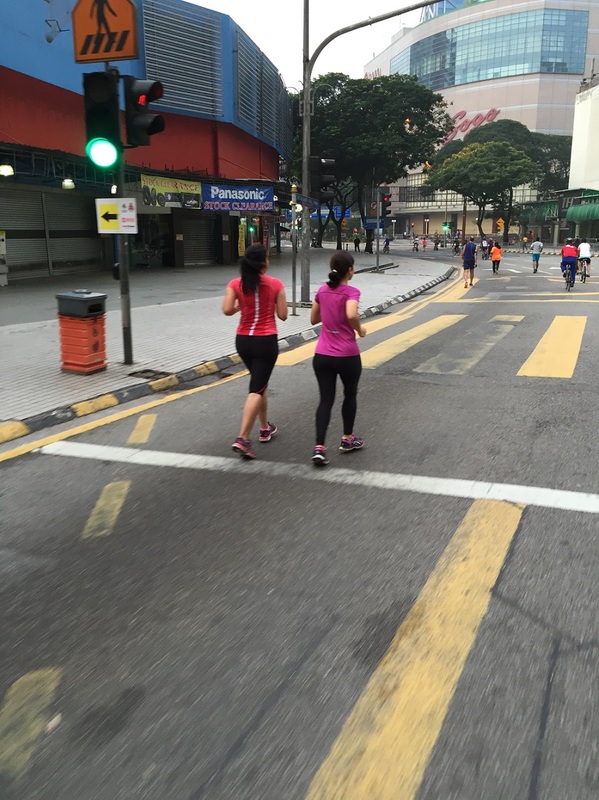 Average gradient here is 12 degree for the 1st 2km but there are a few stretches are ranging from 15-20. 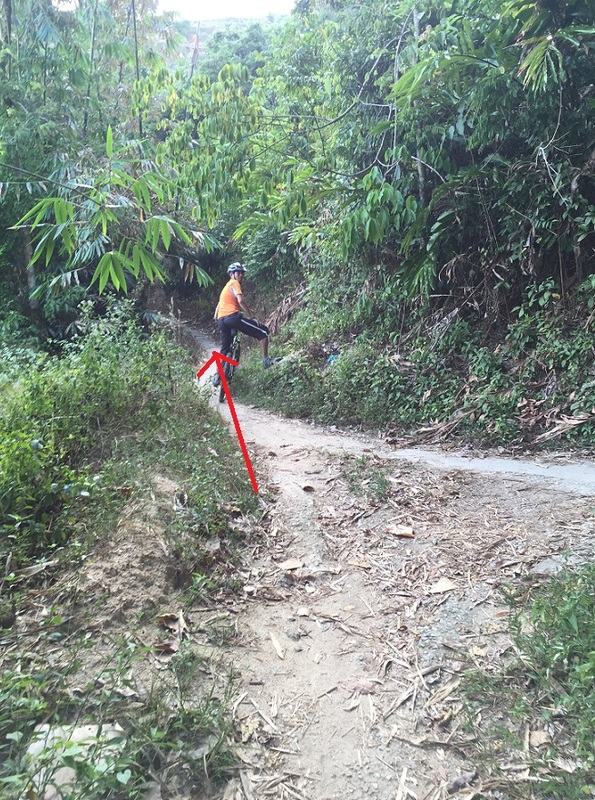 The difficulty is not only steep but you will have to balance it on a single track cemented trail. 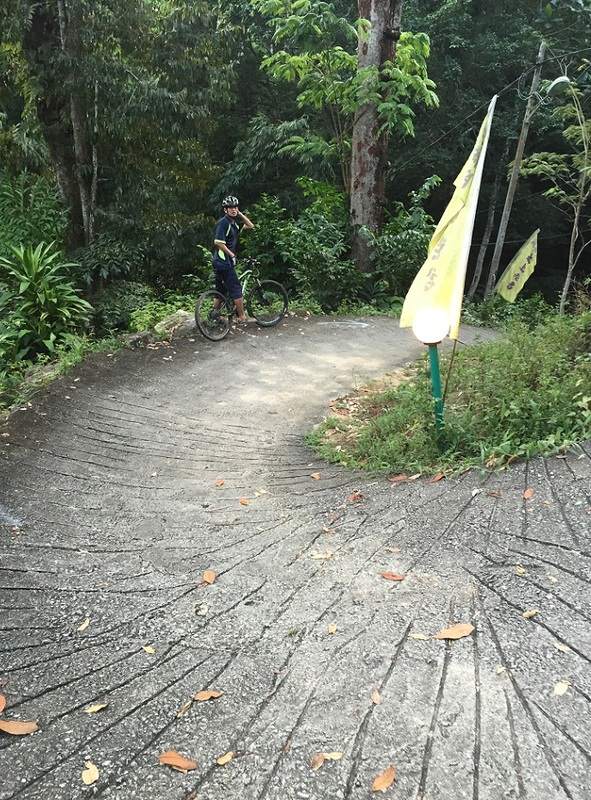 Also, there are some switchbacks with >15 degree climb. This first 2km is basically just climb and climb. There is no way that you can find a flat ground to rest. Just have to climb slowly or push the bike. 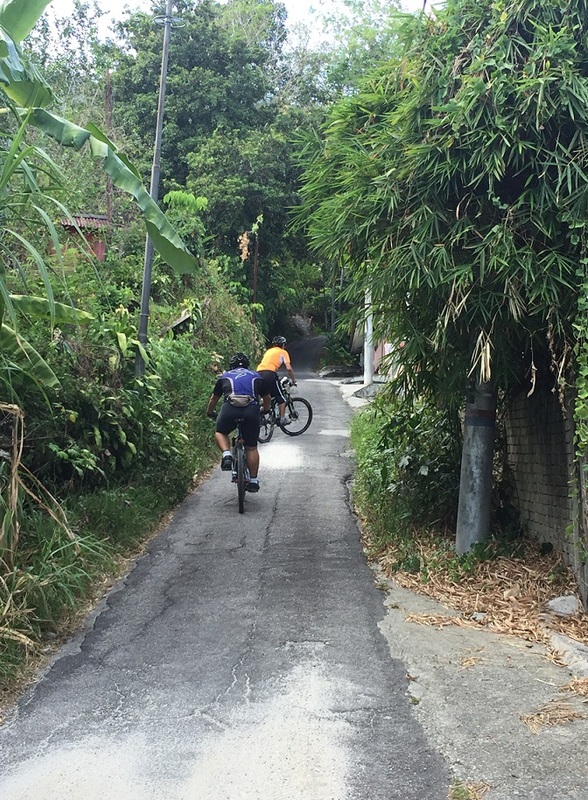 After passing the 2km mark, it is an easy riding all the way to Middle Station. From Middle Station to the peak has some climb but it is manageable. You will come down to a Chinese Temple before hitting the Fox trail. Also, the trail is very cooling as it is covered by trees on both side of the path. Well, have fun with you ride… Just follow these pics to get to Fox Hill and back to AID. Turn into small street right after the bridge. Do follow all the arrow indicators. After riding for a while, you will see this tree and don’t forget to stop for this beautiful view (or more like catching my breath here). It was time for us to move on before it got dark. 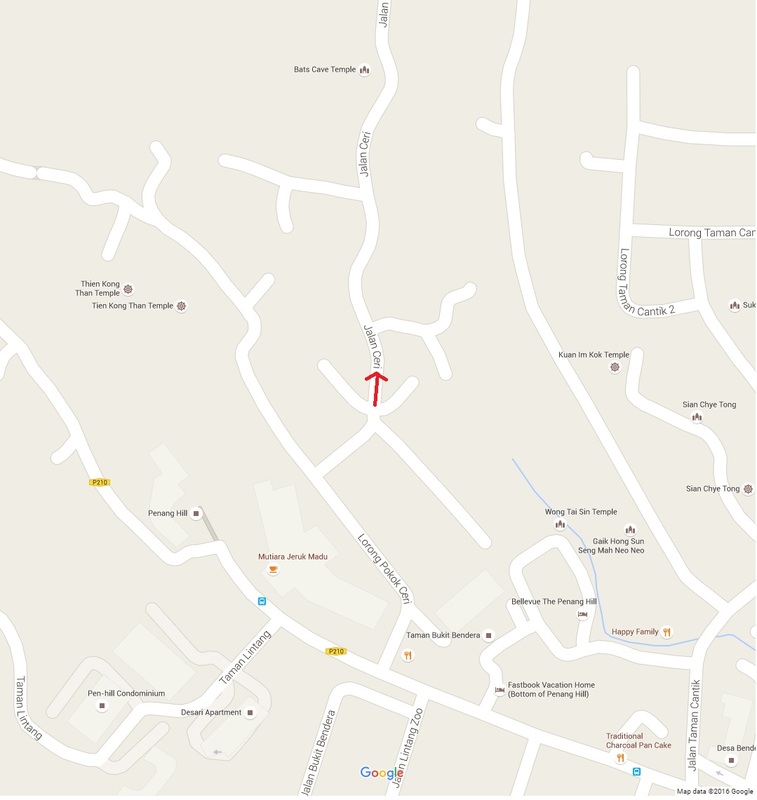 Turning right at both of these junctions will lead you to people’s farm and do beware of dogs. 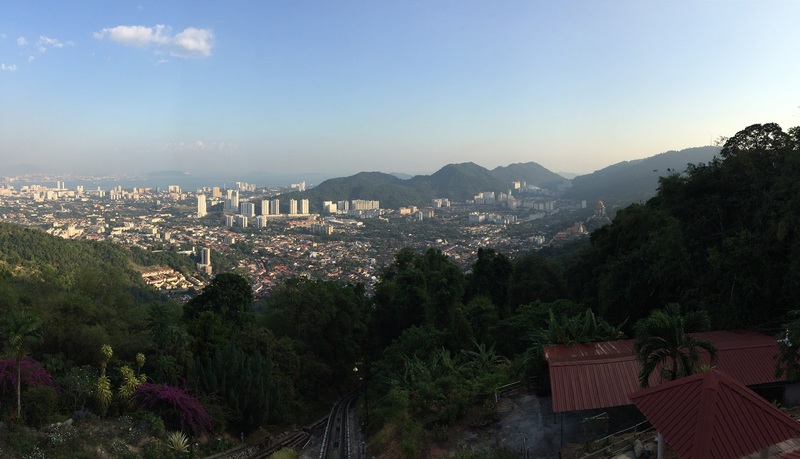 After the 2nd left turn and a slight downhill, you will hit the Penang Hill Middle Station. Take a panorama view here. More uphill after the Middle Station. You will see a Chinese temple on your right after the 2nd pic (right pic) below. Once you pass the temple do look out for the Fox Hill Entrance. Entering the trail will be on your right side. 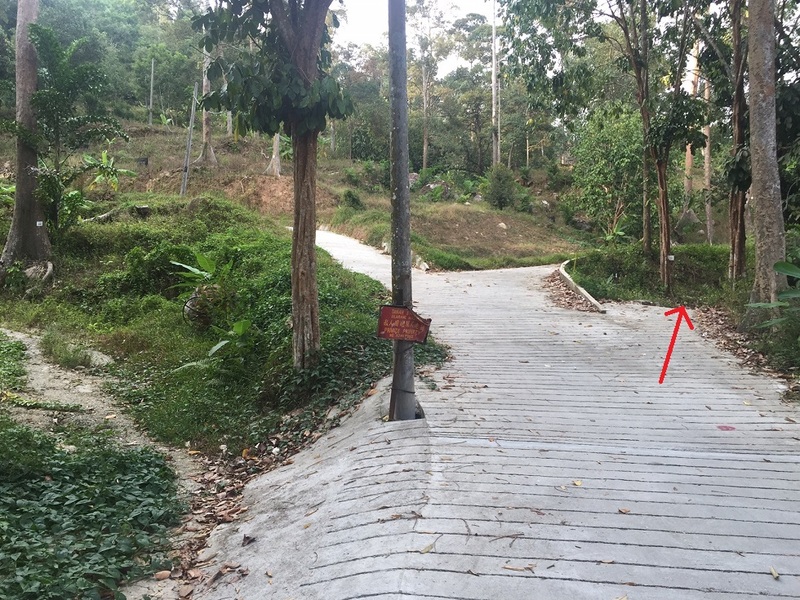 If you miss the trail entrance you will be going down to AID via TSLK. Take note the pic below was taken coming up from TSLK. 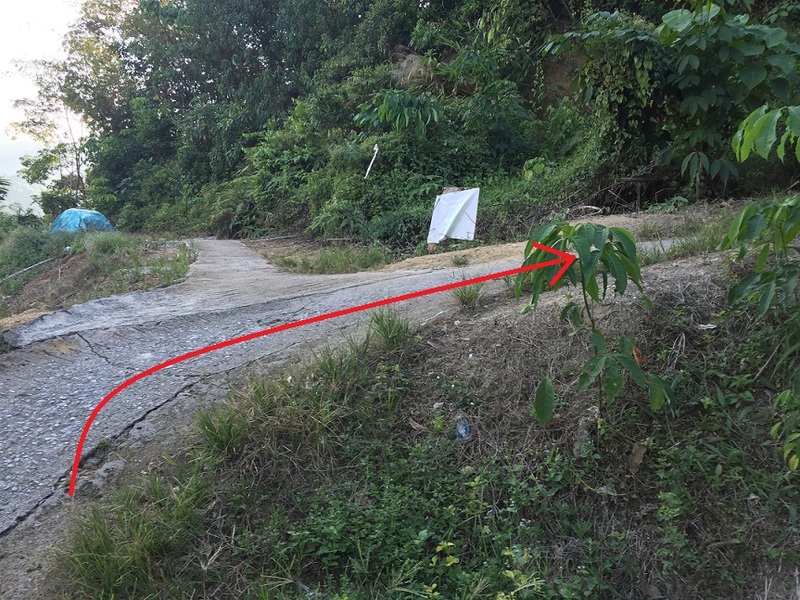 So, coming down from Hye Keat your entrance is on your right. 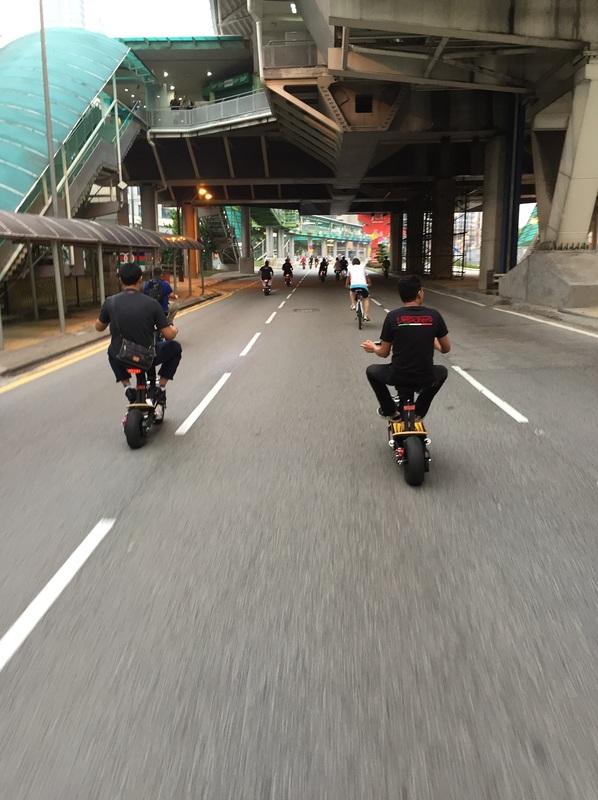 Couple of days ago I rode in Sg Ara after I have stopped riding there since last June. 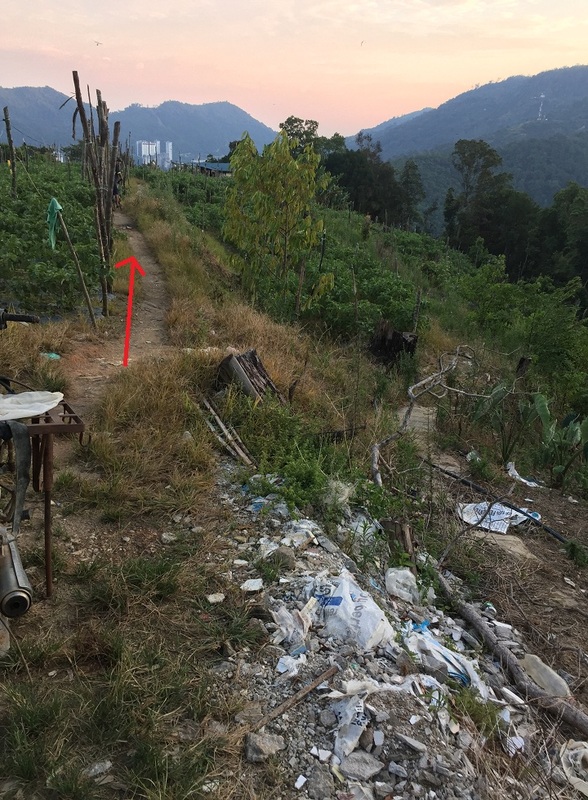 I noticed the path has been widen near the Rubber Trail entrance. Do take note of the changes and don’t misled by the wider path. 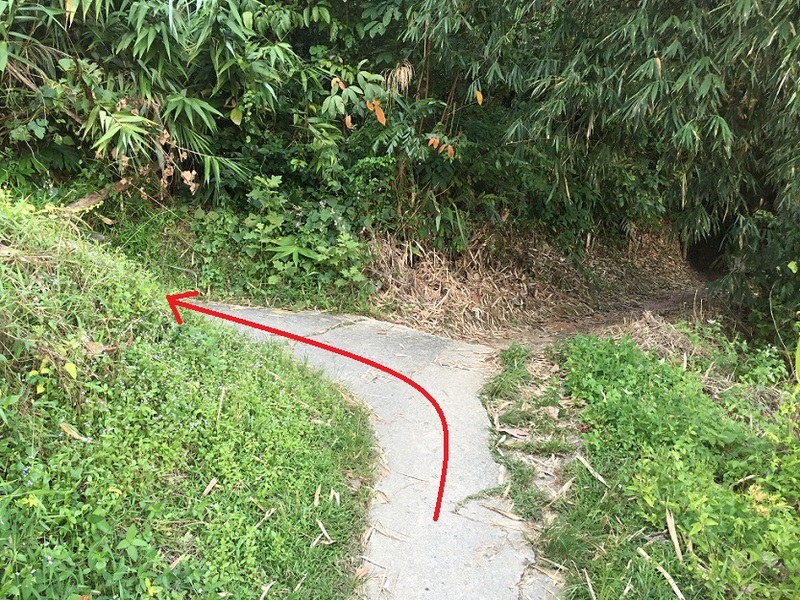 It is just a small entrance next to the wider path as shown in my picture below. I have updated the pic in my previous blog too. Well, there is good and bad about it. 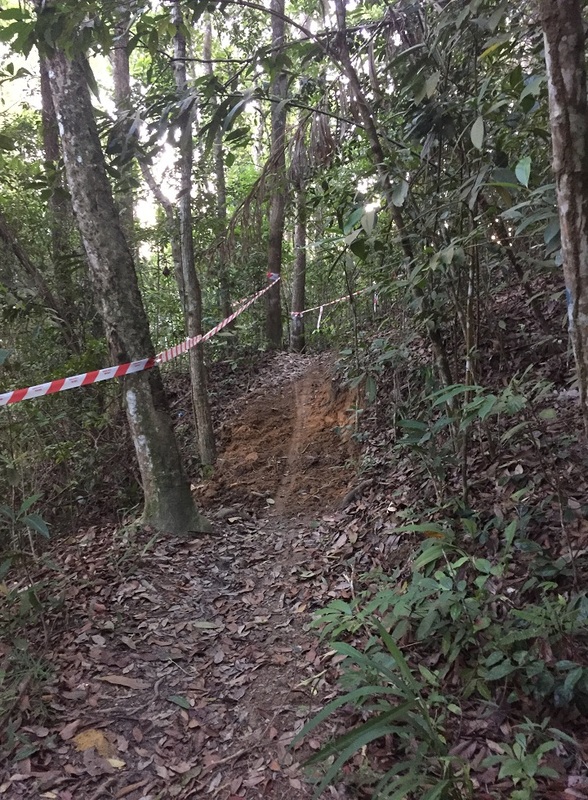 Now the hikers will have place to avoid the cyclists coming down or going up Hill Turn Hilton or Ngor Hean. Also, a place for beginners riders to train the off road. 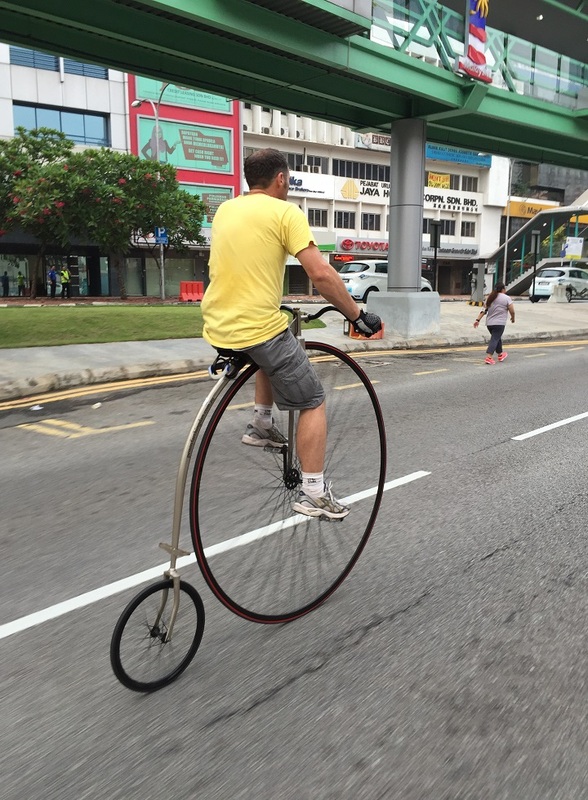 Bored of cycling in Georgetown or the dedicated bicycle lane? Wanna get away from the city center? 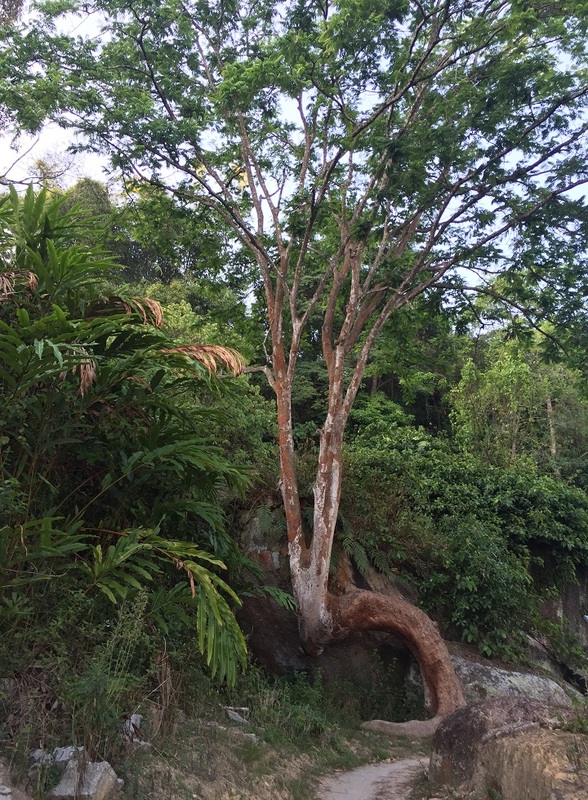 Well, why not come to Balik Pulau to enjoy the nature and tranquility. 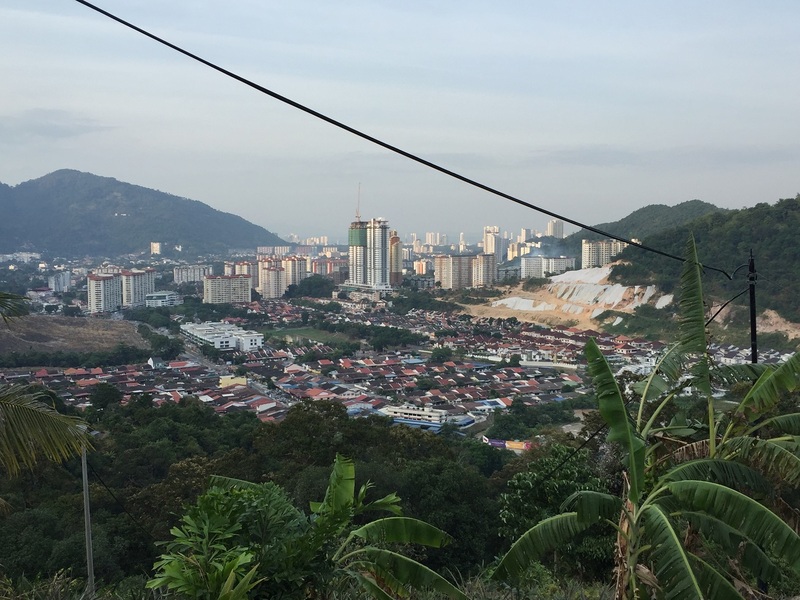 It is a good thing that Penang is a small island as you can head west or south of Penang Island from Georgetown with only 1 hour drive. 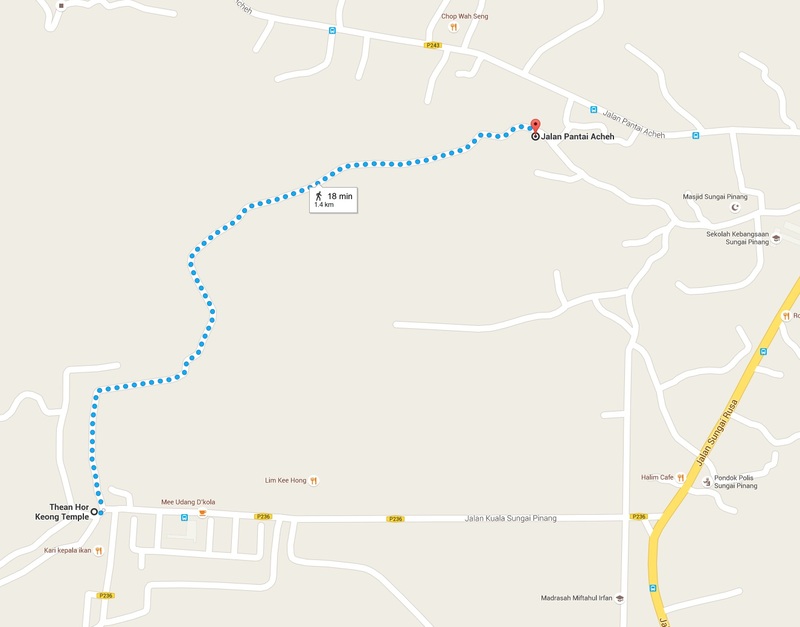 There are many kampong (village) trails in Balik Pulau and I have just explore 1 but it is not going to be my last one. I will definitely go back there again when I find time. 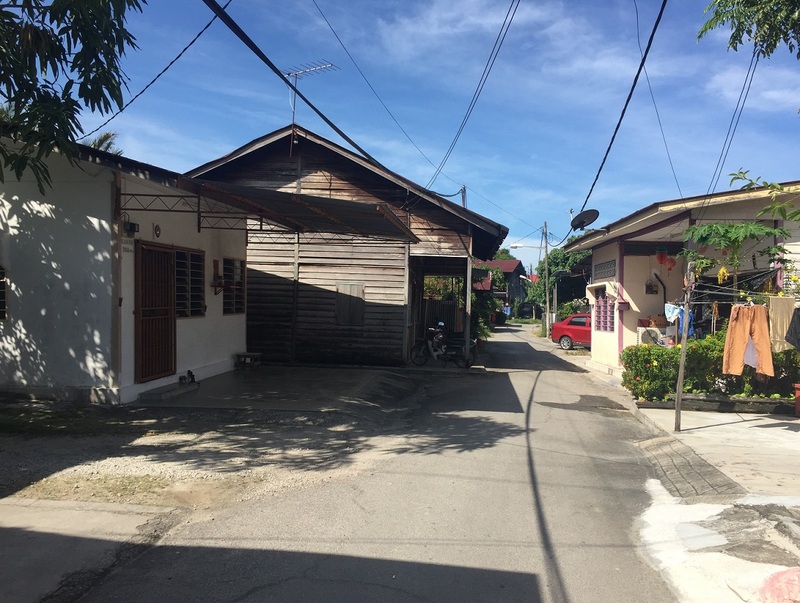 The one we went was at Jalan Kuala Sungai Pinang off Jalan Sungai Rusa. There are plenty of space to park your car and I parked it outside of a school. 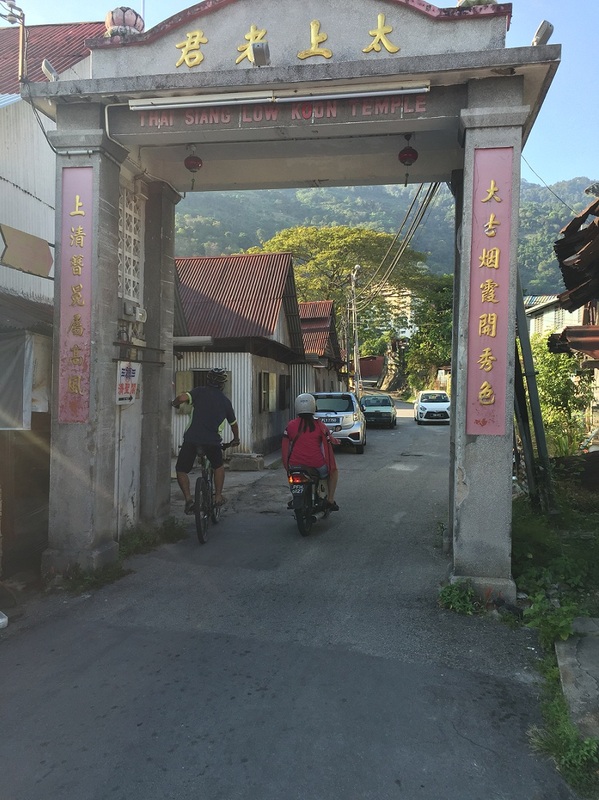 We started off our bike ride at Thean Hor Keong Temple and move inwards. I wouldn’t classified this as a trail at all, as a truck can drive by also. So, a better term will be a fire road. I would said 70% of this road is off road and 30% tarred. There were no cars at all when we rode there and with just a few motorbikes and cows. The roads are quite shady and we didn’t feel hot even we rode at around 10-11 in the morning. Since not many motorized vehicle pass by, this place is quiet and peaceful with a great view. You pretty much see greens and stream running down along the path. Since the road is quite short, we continue our journey to Pantai Acheh to get a bit of distance. From here it was all tarred road and on a main road. 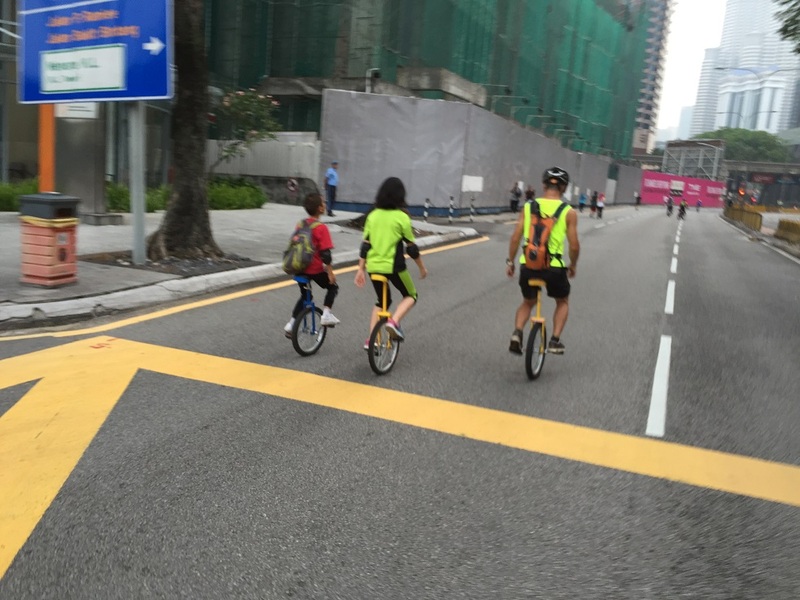 Though not many cars around but they can be quite fast, so be a look out if you have small children riding with you. 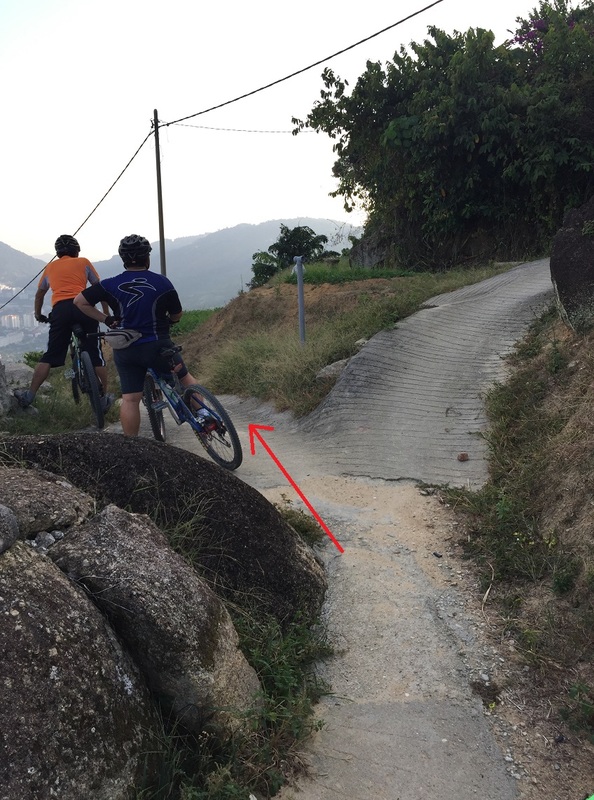 Also, there are 2 small hills that they need to climb but not difficult. 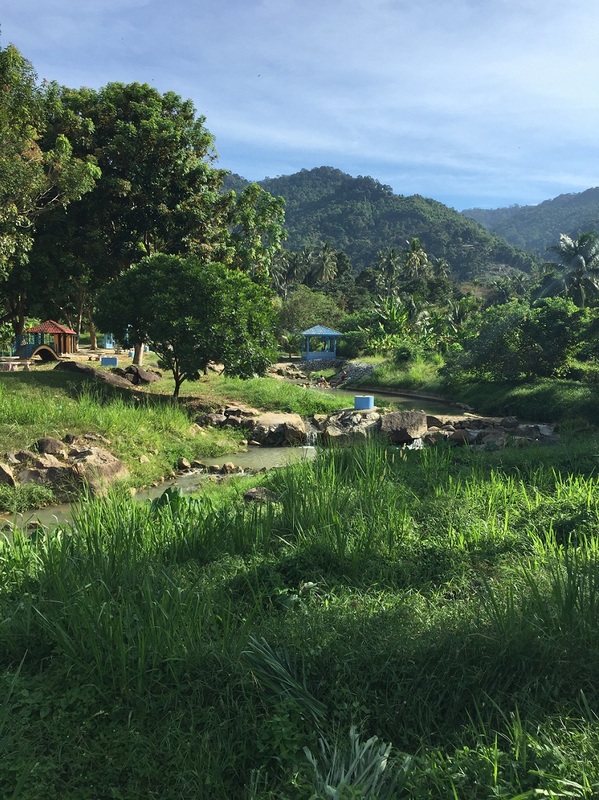 At the end of the journey, don’t forget heading to Balik Pulau town for a bowl of delicious Asam Laksa and a freshing nutmeg juice. 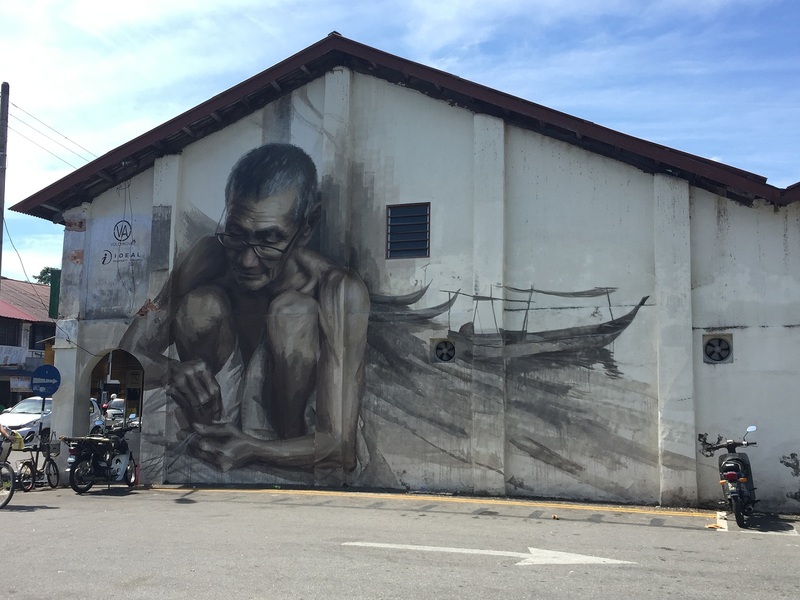 At the same time do enjoy the latest piece of Penang street art. 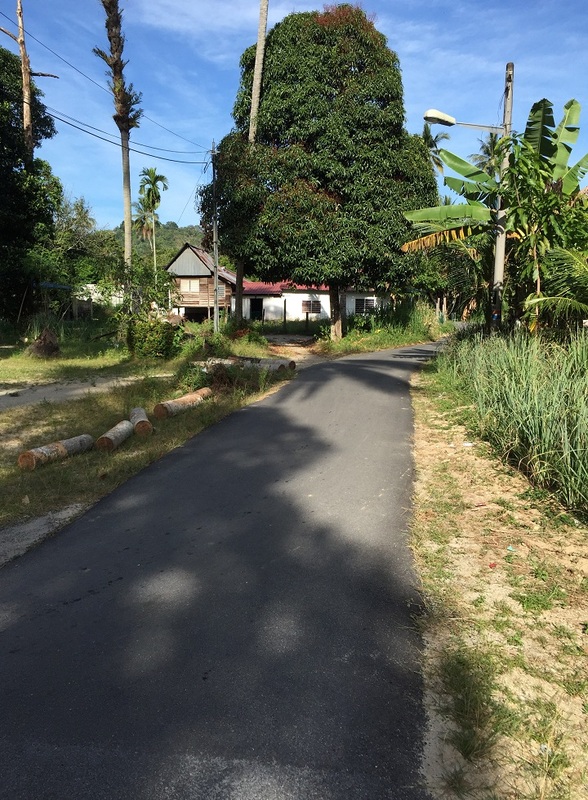 There are bicycle rental and tours you can join in Balik Pulau such as Explore Balik Pulau or Audi Homestay. Or you can bring your own bike and follow my path. 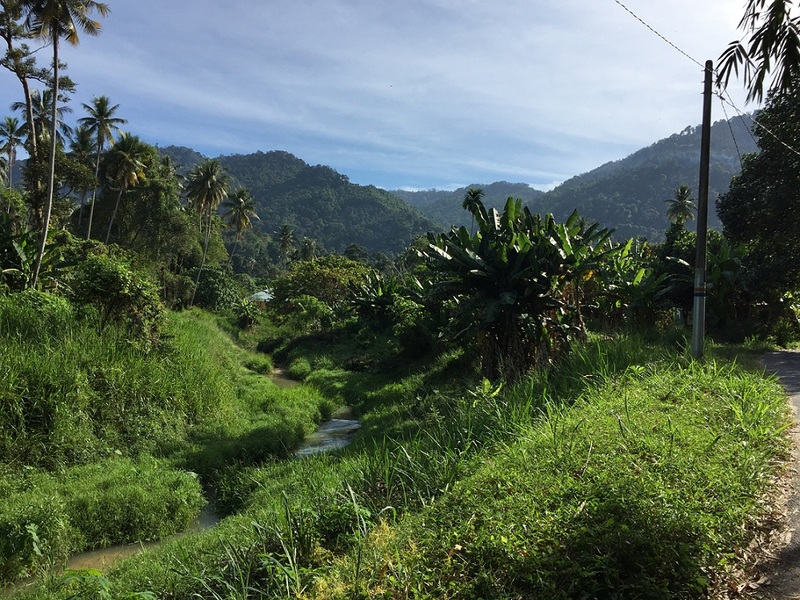 My next exploration will be riding around the paddy fields and fishing villages. I am sure it is going to be another relaxing ride. 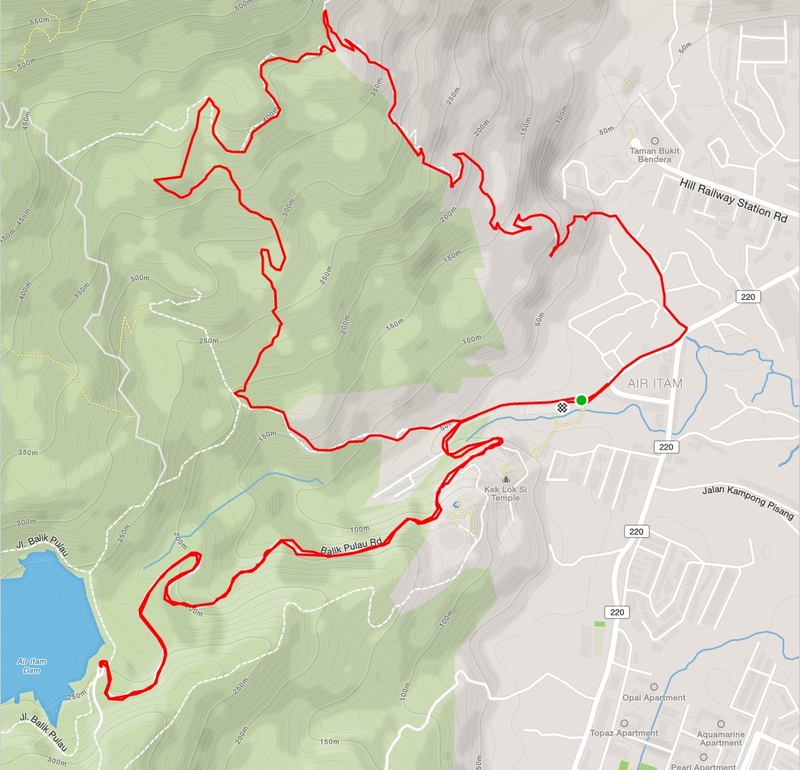 My intention of this ride was to try out Fox Hill as it is an off road trail. 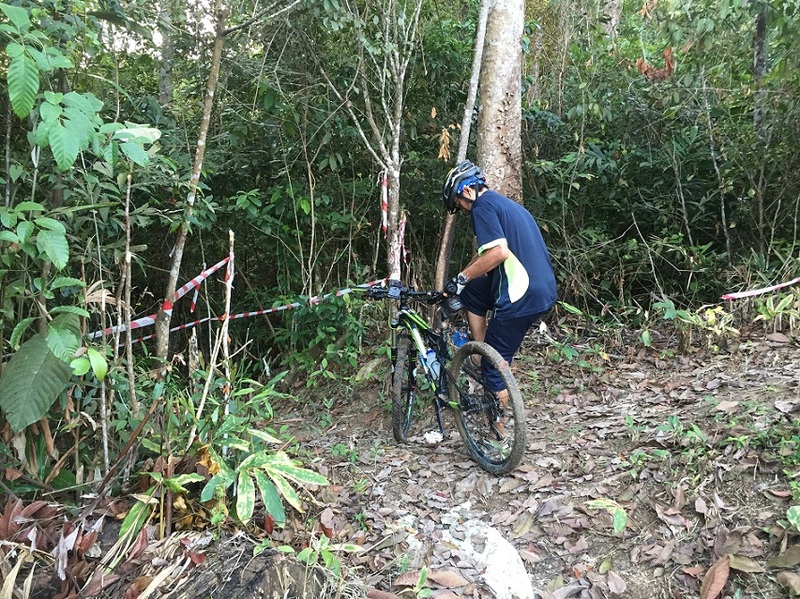 To find an off road trail in Penang is hard and it is even harder if it is for XC ride. 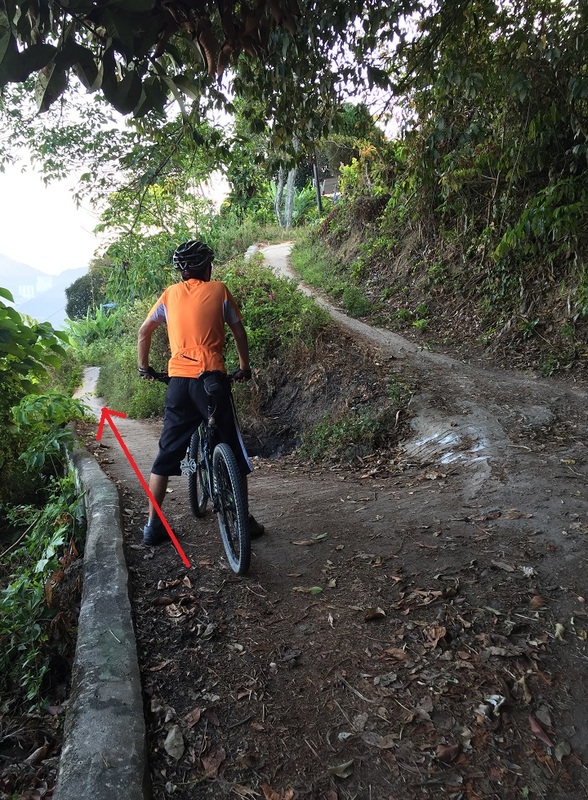 One by one, the trails are converted to single track cemented and some even make it to jeep tracks. Like in Hill Turn, Ngor Hean and Oh Kio. 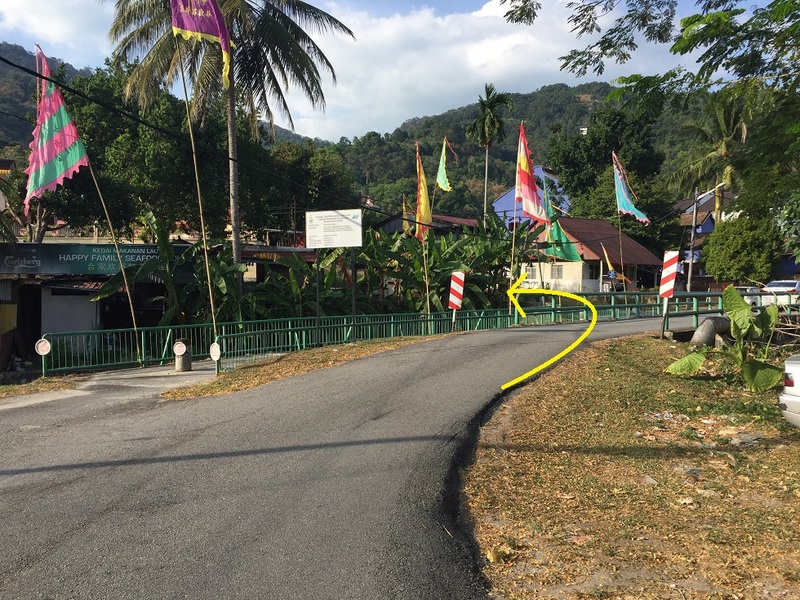 There are a few ways to get to Fox Hill and going thru Thai Siang Low Koon is being 1. We used that for shorter route and avoid the afternoon sun. Thai Siang Low Koon or better known as TSLK to Penang bikers. 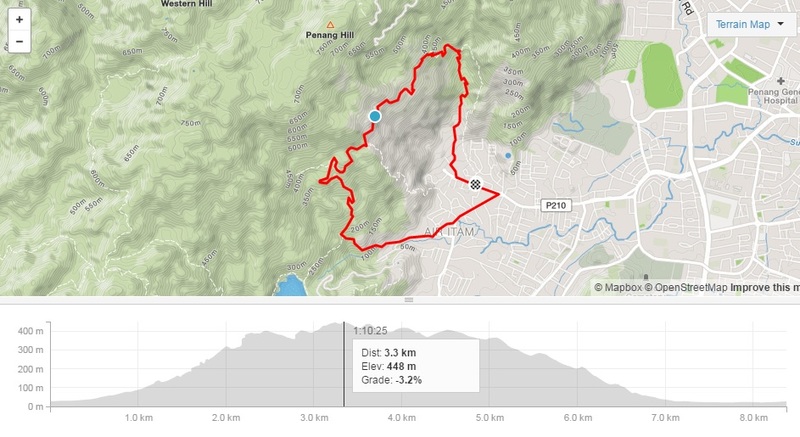 It is also one of the toughest route to cycle in Penang with the highest elevation of just 431m. It is not about the elevation as it is more about the continuous steep climb. 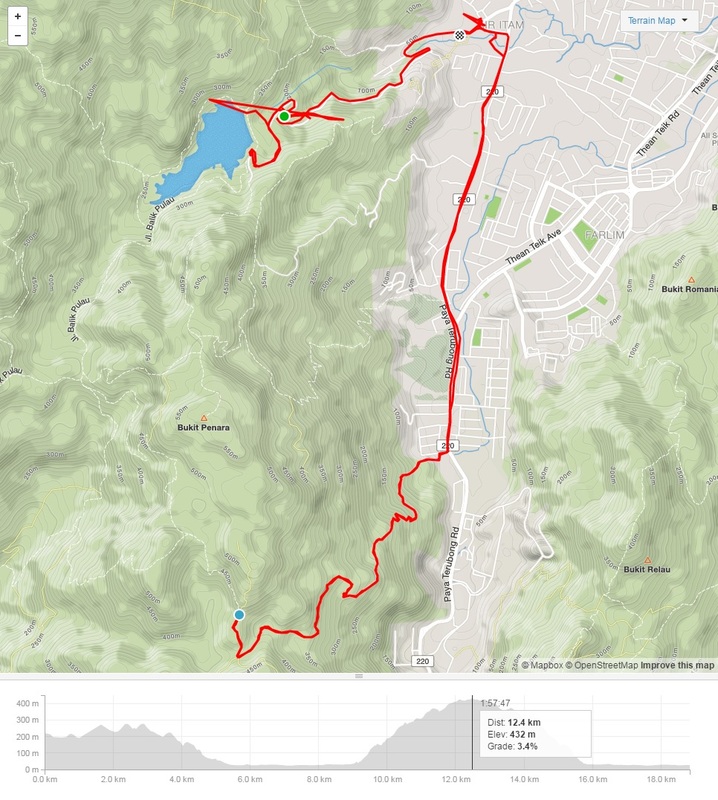 For ~1.4km, it is all about straight climb without any flats or an average gradient is 17 degree. 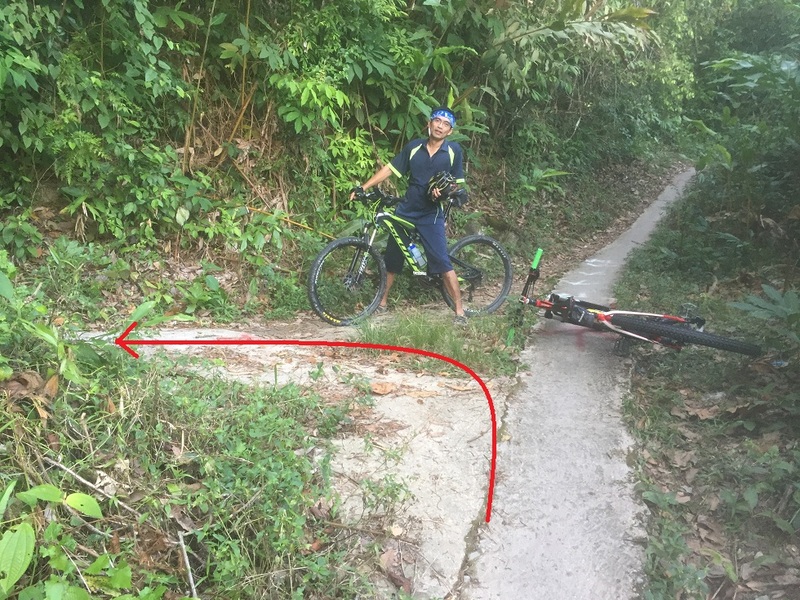 There are 2 parts of this trail has the hardest climb which is about 26-30 degree gradient and it is a single cemented track. One of them is named Stairway to Heaven as all you can see is the sky when climbed this stretch. 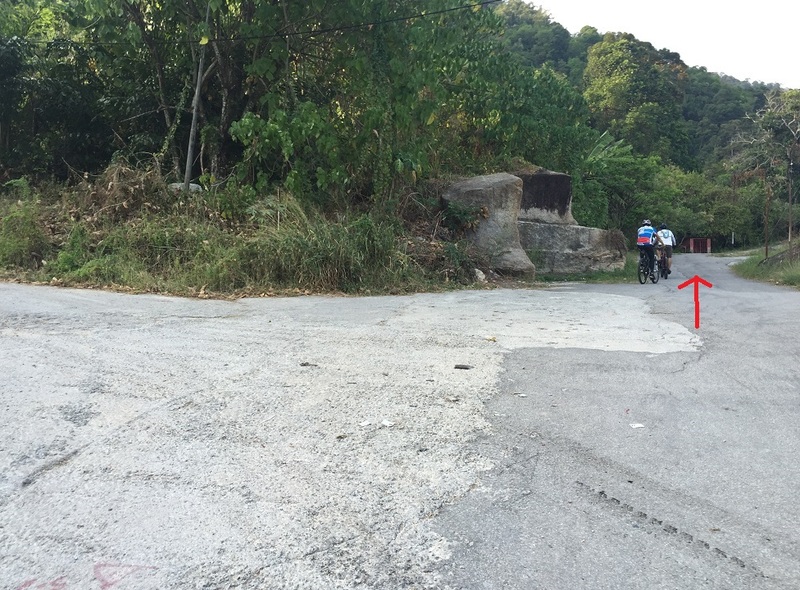 Right after this toughest climb, it will have another shorter climb with about the same gradient. By now, I was so exhausted and my legs were screaming to stop and heart asked me to cool down. 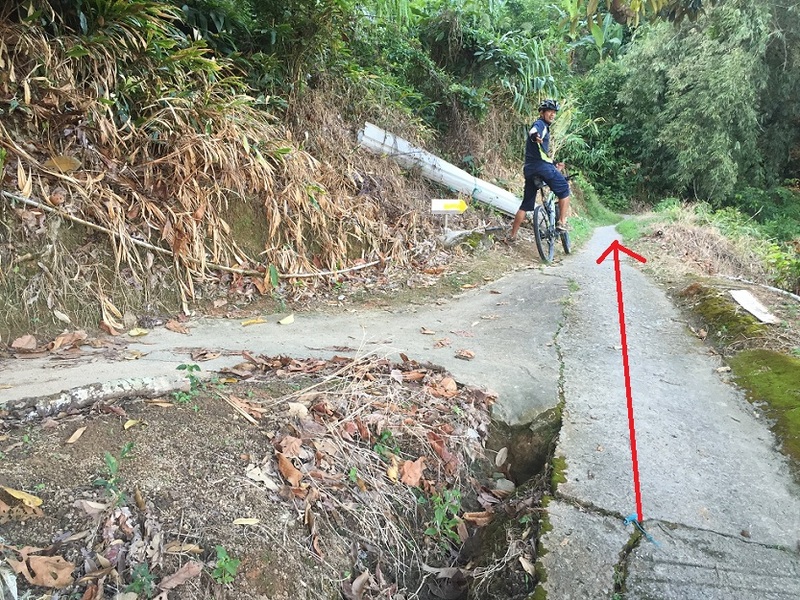 Strava has ranked this place as Category 2 climb. Fox Hill is not far after the 2nd toughest climb. Smell of relieve for me. 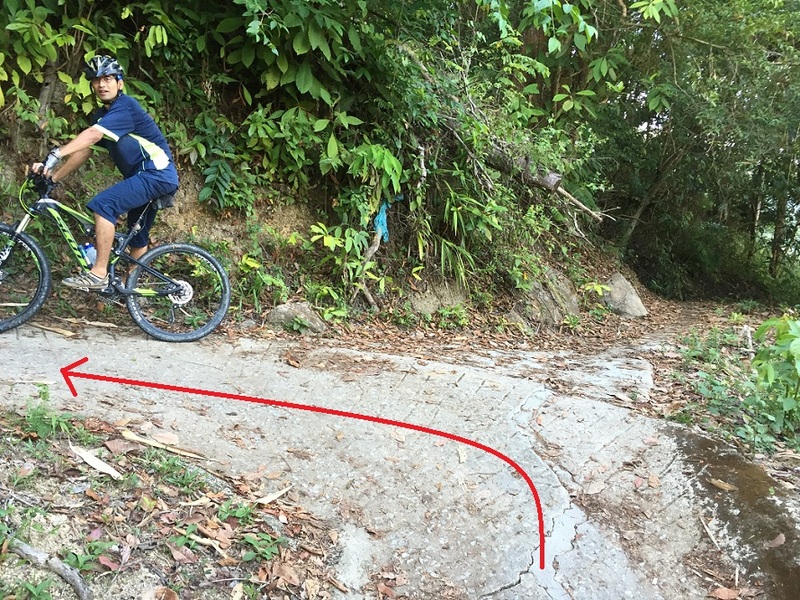 Fox Hill is just 2.1km off road with some pedaling require at certain sections but mostly are downhill. The trail is well kept for now as they just cleared that part for a competition. So, some parts the soil was a bit soft. 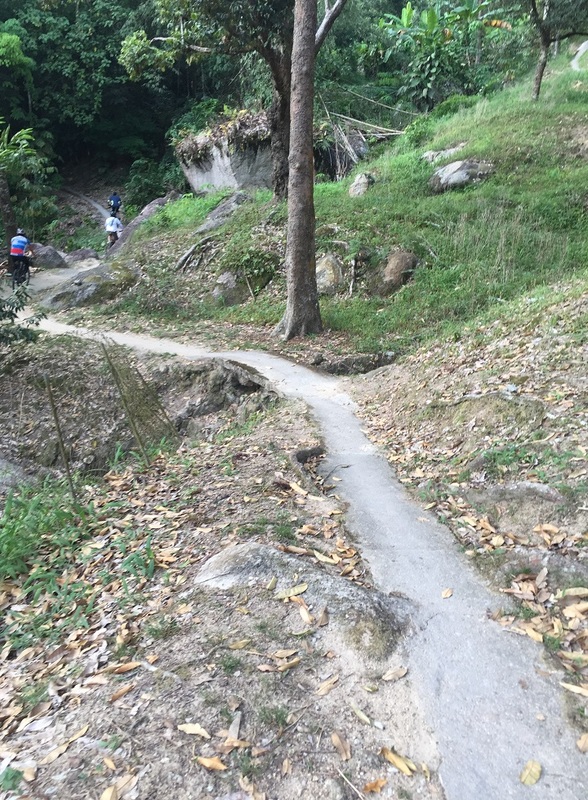 The trail was covered with tree roots and drops but too bad no switchback. 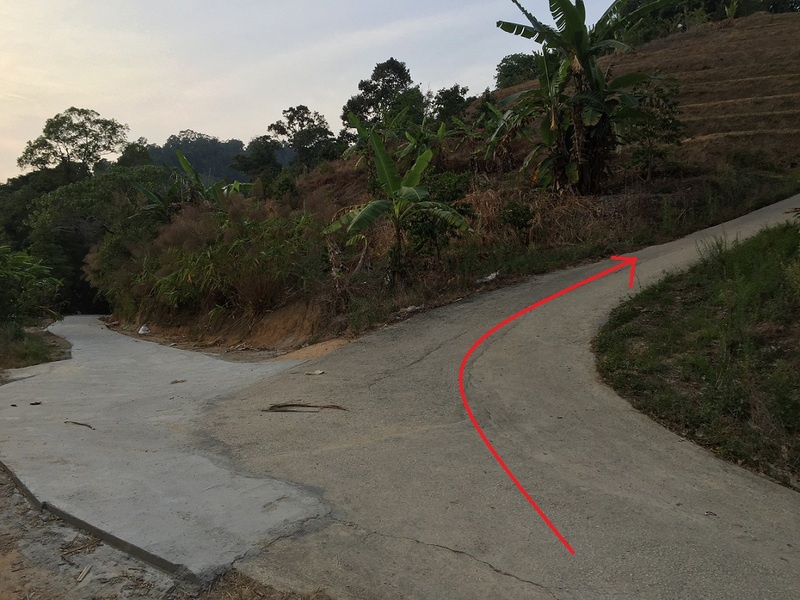 It is hard to find non-cemented switchback in Penang. 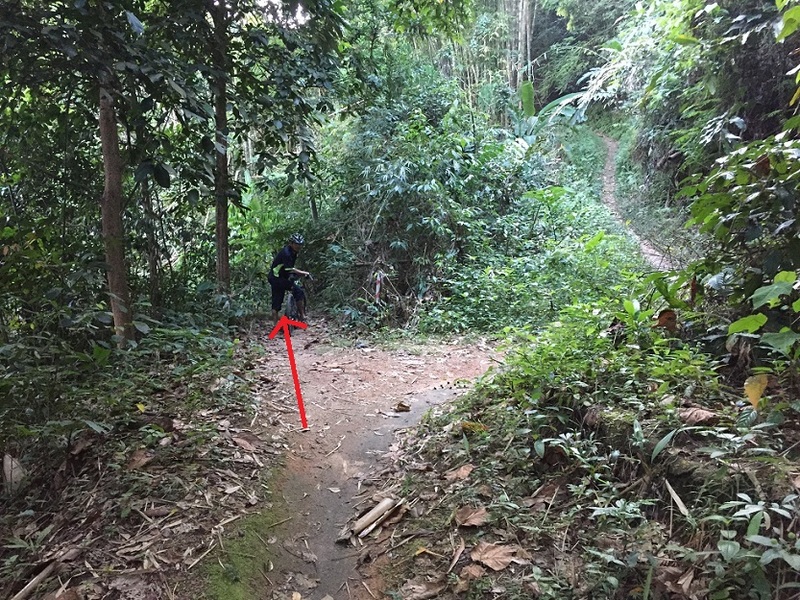 The trail is single track and some part is just next to a cliff but it is rideable. This place reminds me Bukit Kiara in KL. 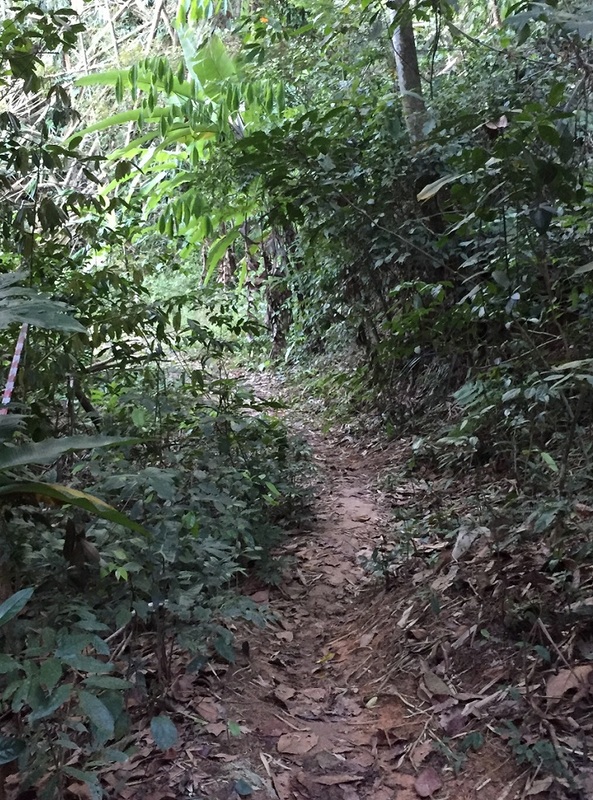 The exit of the trail is linked to Tua Peh Kong Temple in AID. 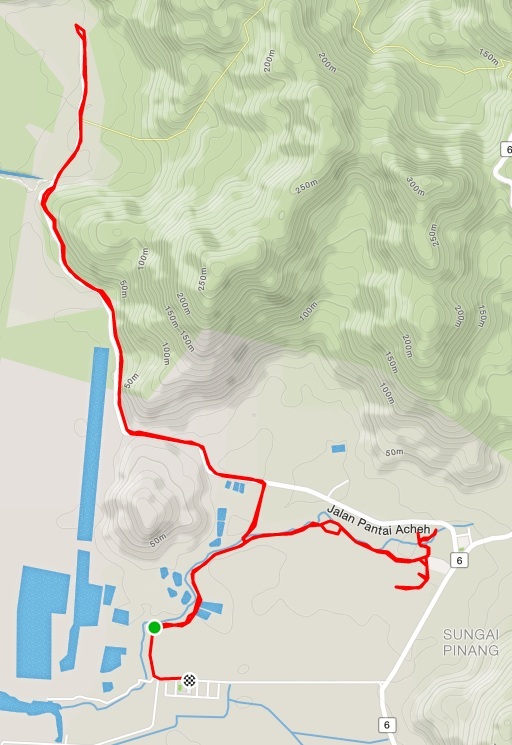 It took me about 38 mins for the ascent and descent, so it was still bright to do another loop up to AID. I had fun and I will come back again but will not go thru TSLK this time. How to get there? Follow the pictures below 1 by 1 and you won’t go missing. 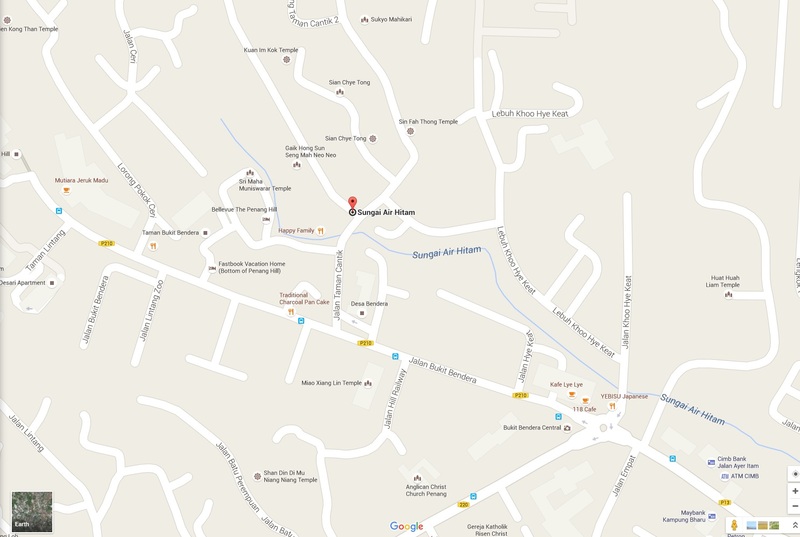 The entrance to the place is near the Air Itam Police Station. Look for the arch below as it sandwich in between a coffee shop and a house next to Indian Temple. Then follow the red arrow and always follow the main path. Don’t worry about those path connecting to it. You will hit a trail built in between the hut. This is Stairway to Heaven. Stop for another breath taking view before continue on. Finally, the Fox Hill entrance. 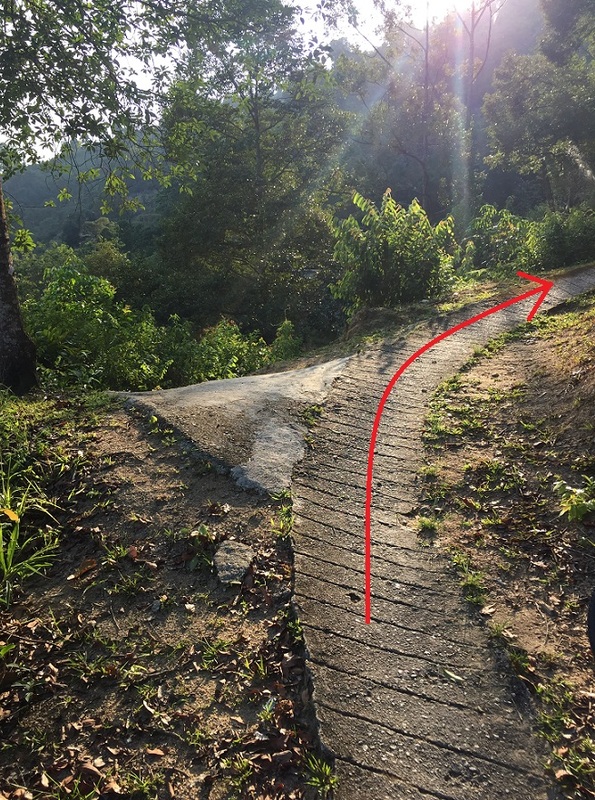 This is the only connecting path that is off road and they sprayed pain on the floor. 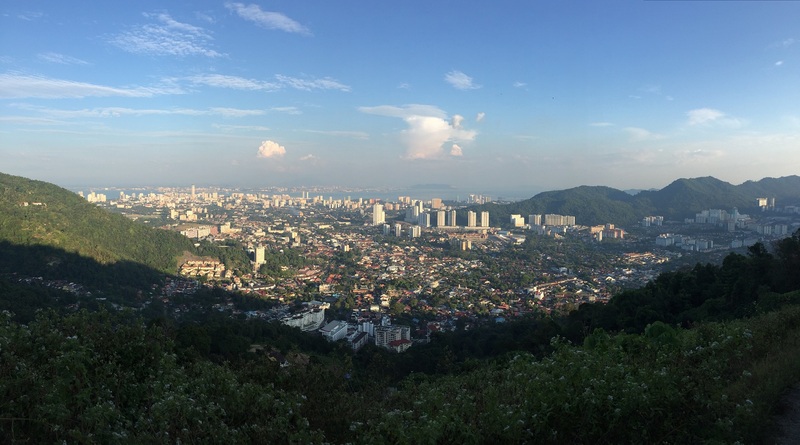 Going straight will lead you to Penang Hill. My friend told me always follow the red and white ribbon and you won’t go missing. 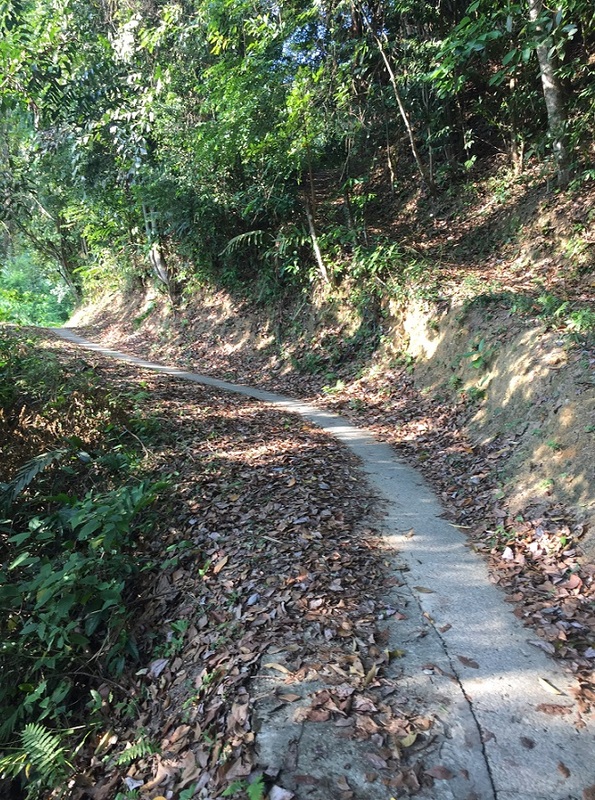 The end of the trail which will connects back to the cemented track and down to the Tua Peh Kong Temple. Never have I ever felt this lethargic before. 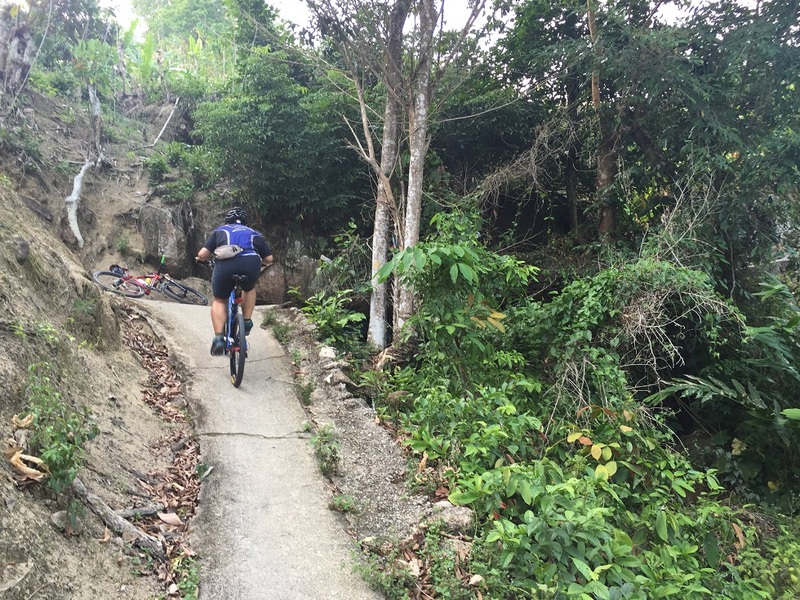 Came back for cycling with P2W team to Pulau Betong and back using Batu Ferringhi hilly and winding road. 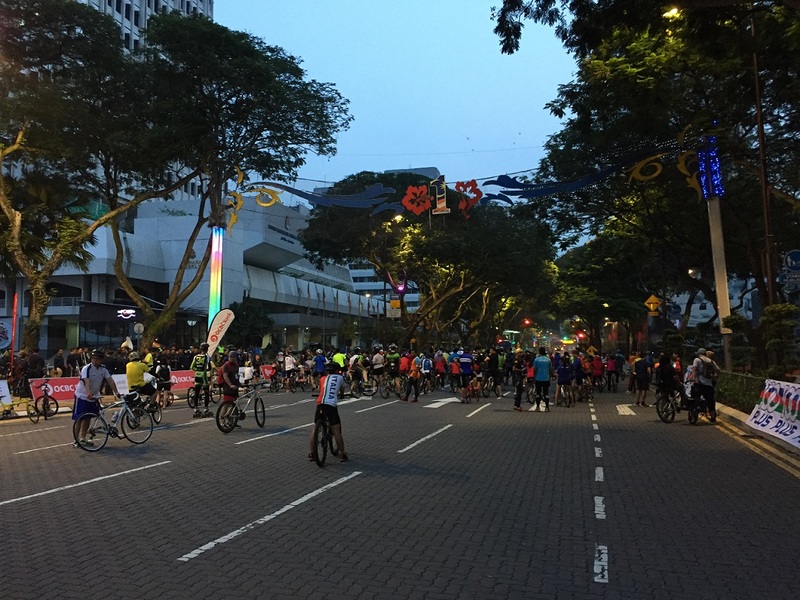 Was so exited for this morning ride as it has been awhile since I last cycled with a large group. Leading the group whole way from Island Plaza till Teluk Bahang. Once reach the dam, I was planning to turn back and head home as I started to feel fatigue on both legs from those hilly climbs. 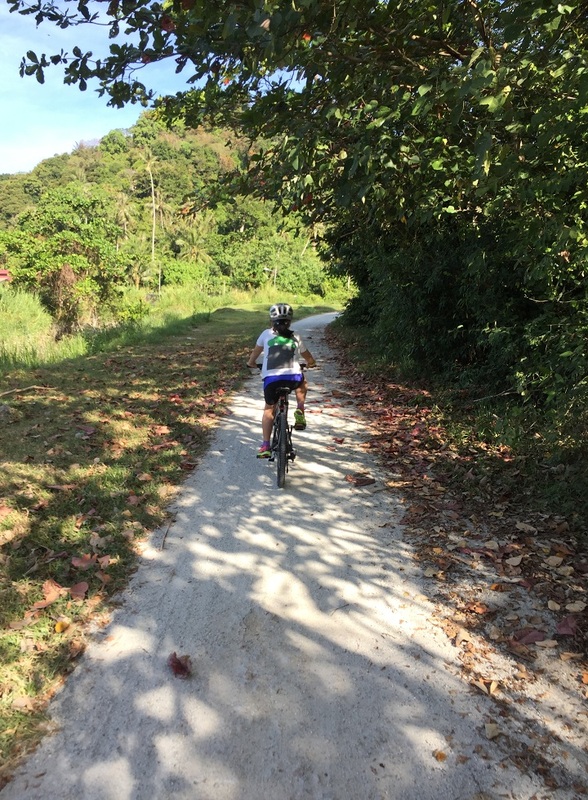 My team mates motivate me and push me so that I’ll follow them all the way to Pulau Betong and back. Feeling heavy hearted, I did follow them with my half fatigue legs. 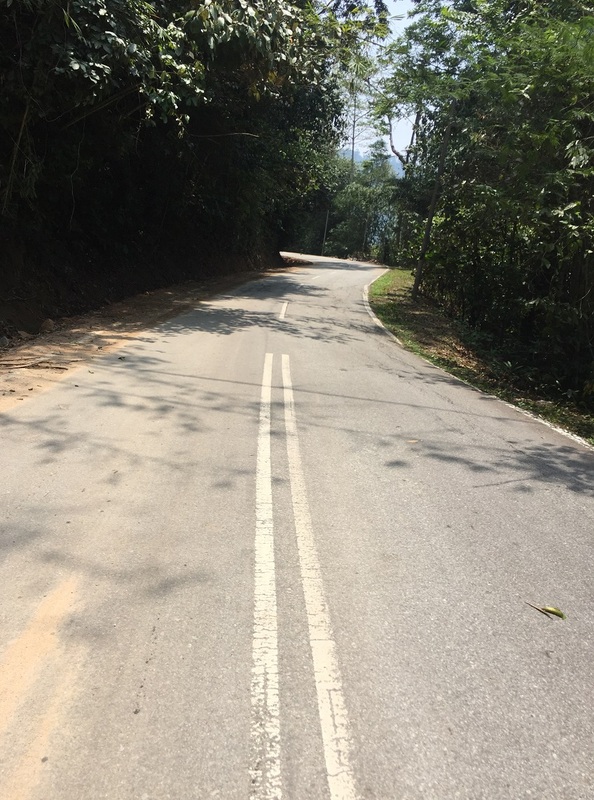 There’s about 8km straight road before reaching Pulau Betong and most Penangites will know this part as the only place in Penang island where you can push as fast as you want without worrying any traffic lights ahead. The moment we entered that road, the team start to place themselves in one straight line which is commonly known as “drafting”. 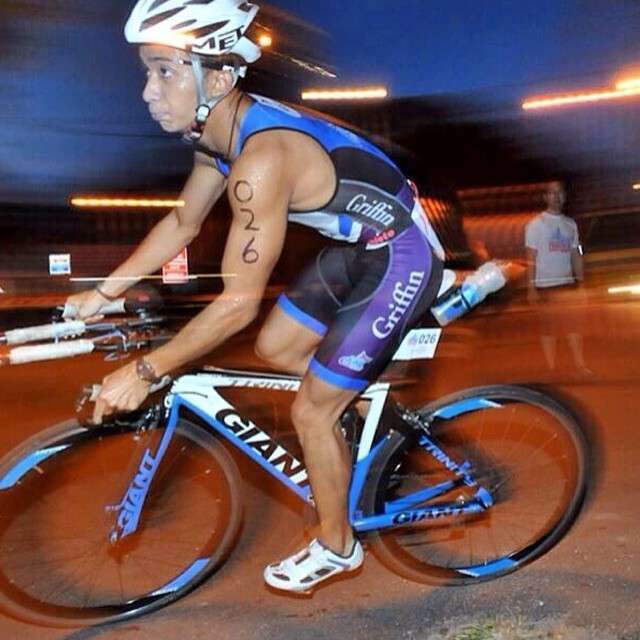 At that time I was in the second group which consist of 6 to 8 riders and most are them are tri-bike cyclists. The first group is 1km ahead of us and most of them are road bikers. 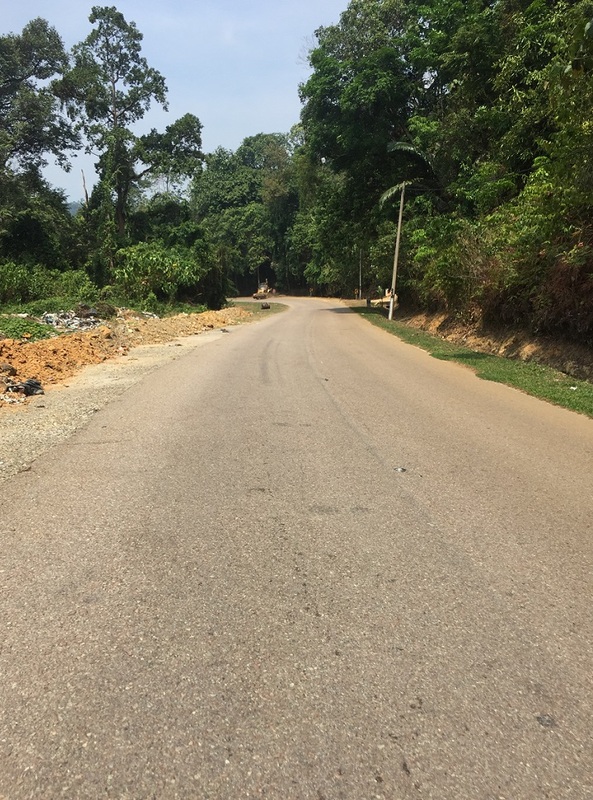 As my team started to cruise along the straight village road, I look down on my speedometer and we were cruising around 41 to 43km per hour and that’s quite fast considering that I haven’t touch my bike for nearly 6 months. I know deep inside myself that I’m gonna bonk halfway but I try to maintain with my group until we reach Pulau Betong and back. 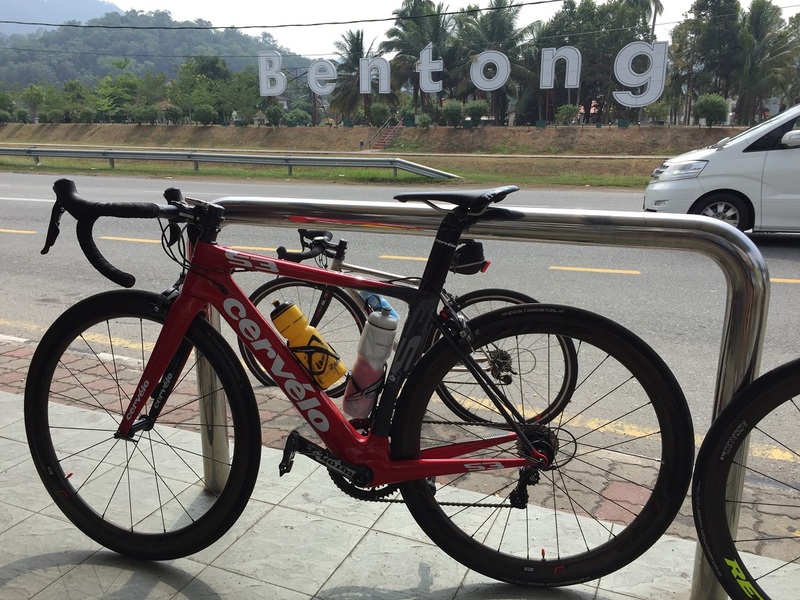 There is this coffee shop at the foot of Balik Pulau hill which is commonly known as Aik Joo cafe among cyclists in Penang. 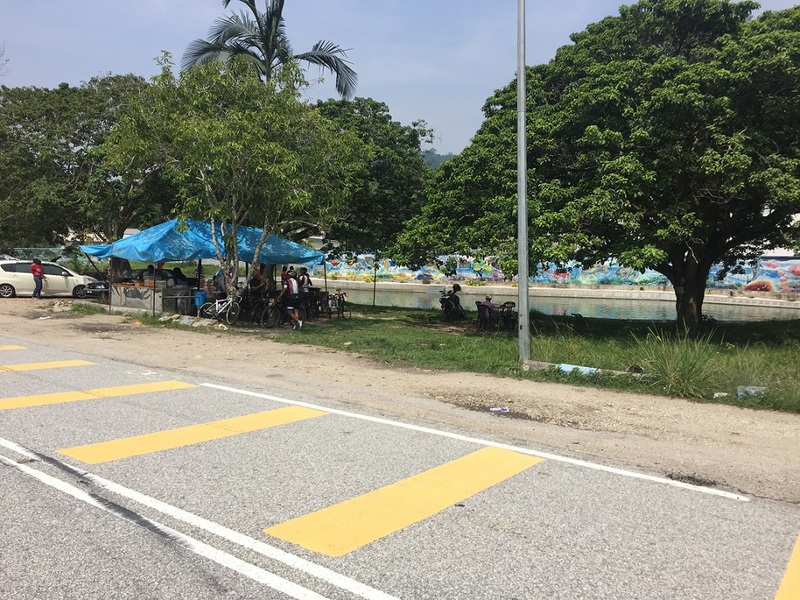 We stop there to refuel, not refuel our bike but refuel ourselves with “milo peng”, “swee kam peng” and 100 plus. At that time I was silent most of the time, tried to calm myself down from the agonizing pain on my legs. 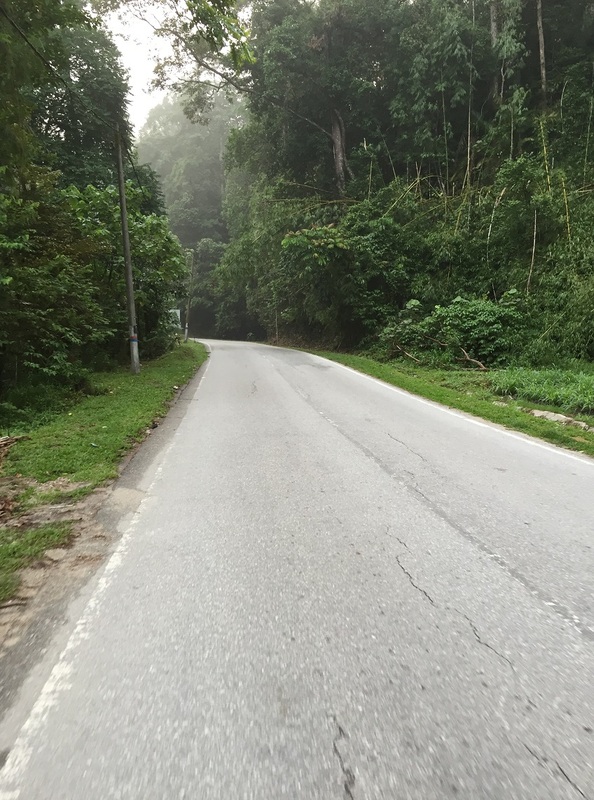 Tried to rest my legs as much as I can before cycling back up to the Balik Pulau Hill peak, which is also known as 800. 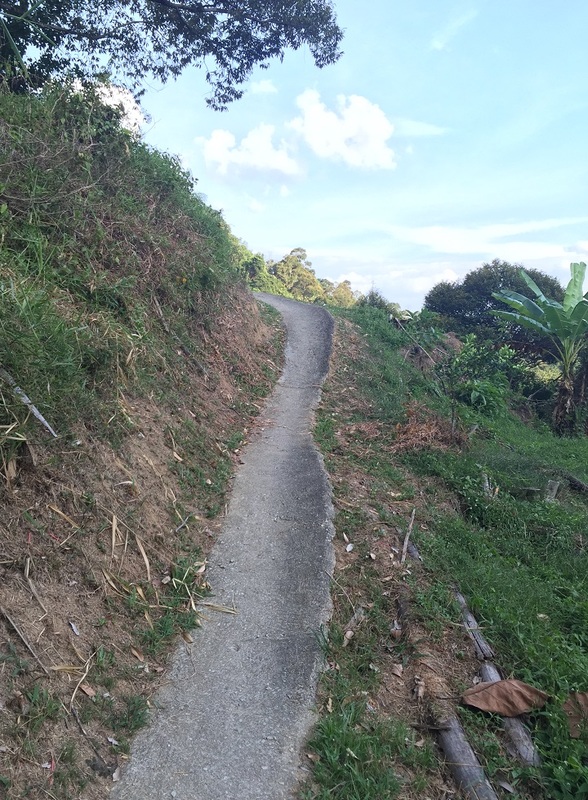 This was the long last climb before we reach Batu Feringghi. So we started cycle up the hill and I was the last guy at the back of the group. 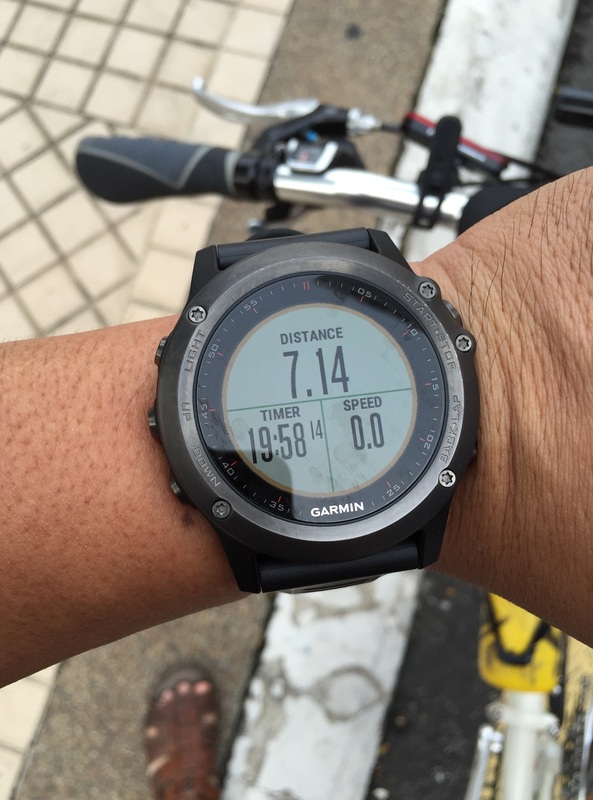 The only thing that motivated me slowly to pedal up was just my trance songs in my iPhone. Head banging and singing to the songs kinda help me to forget the pain on my legs. It was a never ending climb for me until I reach 800. At that time, the whole group was waiting for me to reach the top before we decent together. That was the only best part because I can just relax my legs and let gravity take over my speed. It was a smooth and relax ride till we reach Hard Rock Hotel. I started to notice a few riders in my group cranked up their gear and pushed the pace. I was left with two choices at that time, either draft with them or cycle alone and suffer from the headwind. It was a tough decision as I can’t feel both my legs then and I can’t even stand and sprint with my bike because at the moment I tried to stand and cycle, I can feel both of my quads cramped. At that point, just left 5km more till we reach our resting point. Well, it was consider as a resting point for me and a finished point for others. So I just hang on with the group, trying my best to draft with them. It was the most painful moment that I have ever had in my cycling life. Both legs screaming for me to stop. Hung on as much as I can till we reached our resting point. This is one of the usual coffee shop that we used to hangout before. 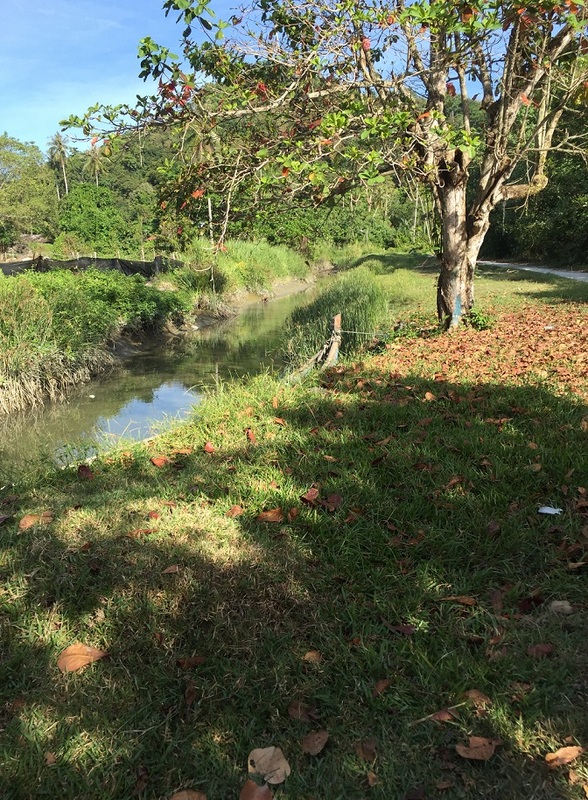 Usually I will have my light breakfast here before cycling back another 10km to my house. I guess this was the first time I didn’t eat anything at that shop, only drinking two glasses of “swee kam peng”. Too tired until I don’t have the appetite to eat. After finish refueled ourselves, we slowly headed back home. Once I reached home, opened the door and my legs gave up and I stumbled onto the carpet. Stumbled really hard. My dad gotta picked me up and laid me down properly as I can’t even stand at that time. I was laying flat for almost 30 mins till I try to stand back on my own legs. I can’t really walk properly at that time and all I can do was slowly walk to my room and laid down on my bed. My upper body was perfectly fine but my lower body was totally numbed. Laid down on my bed and slept for nearly two hours. Didn’t even manage to shower. It was a bitter sweet moment for me as I finally get to cycle with my team mates and to see them improved so much from the past 6 months was incredible. Time to rest my legs and fly back to KL. Will be back on 14th with the hope that my legs will fully recover to cycle back with them.